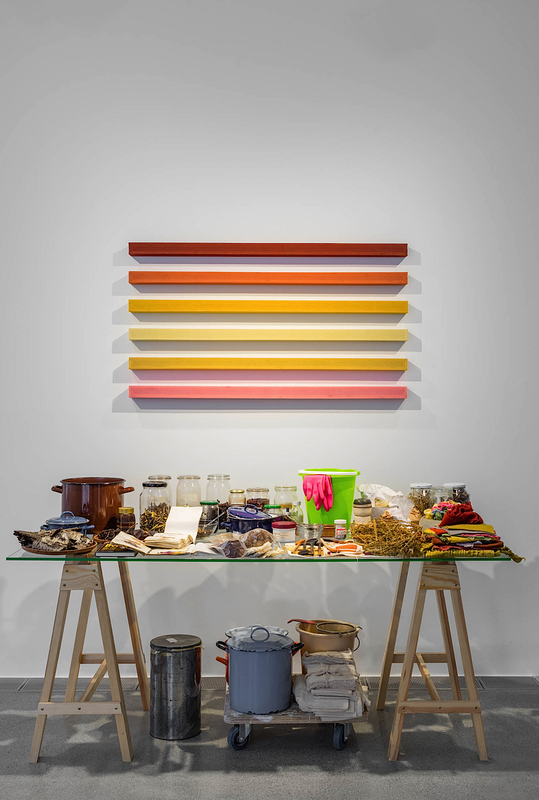 Celebrating its inaugural edition, Influences: Biennale du Textile Contemporain has invited curators Lidewij Edelkoort and Philip Fimmano to create a thought-provoking exhibition about new sustainable materials. Oloron Sainte-Marie is located in Haut-Béarn, an idyllic Pyrenees region with a profound textile heritage – home to authentic berets and espadrilles, the most quintessentially French of fashion icons. 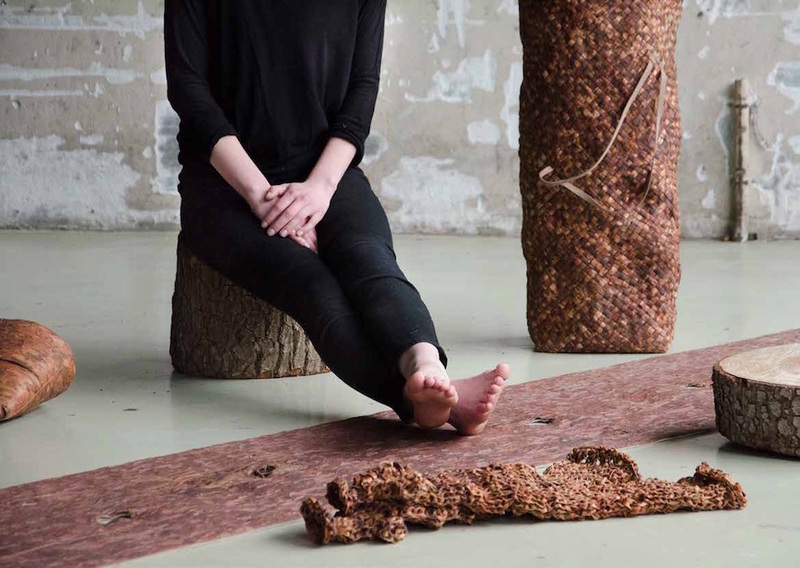 'EARTH MATTERS: au confluence de la nature et de la créativité’ takes place at La villa du Pays d’art et d’histoire, located literally at the meeting point of the Aspe and Ossau rivers, both of which have been central to local textile production for centuries. 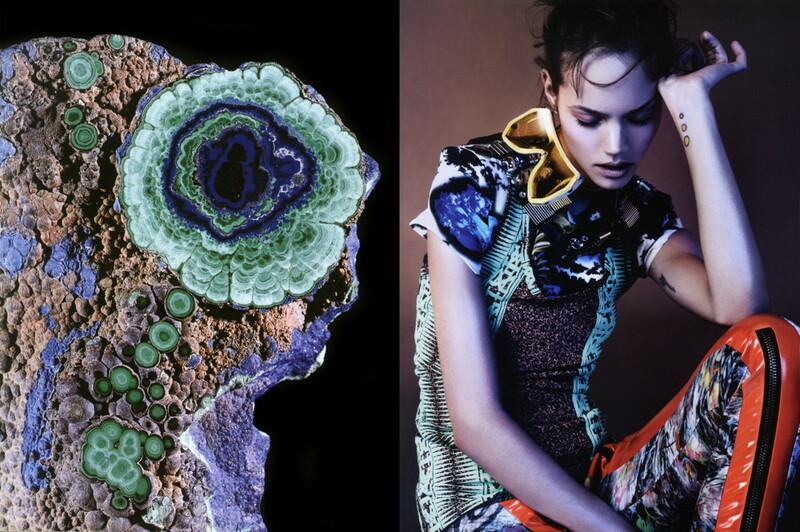 Areas such as design, art, textiles and fashion are increasingly driven by an innovative energy that is inspired by Mother Nature. From land to sea, from forest to mountain, a wealth of ideas sprout from the Earth: analysing and cataloguing its components, transformed by organic fibres, recycled remnants, vegetal colours and conscious farming. 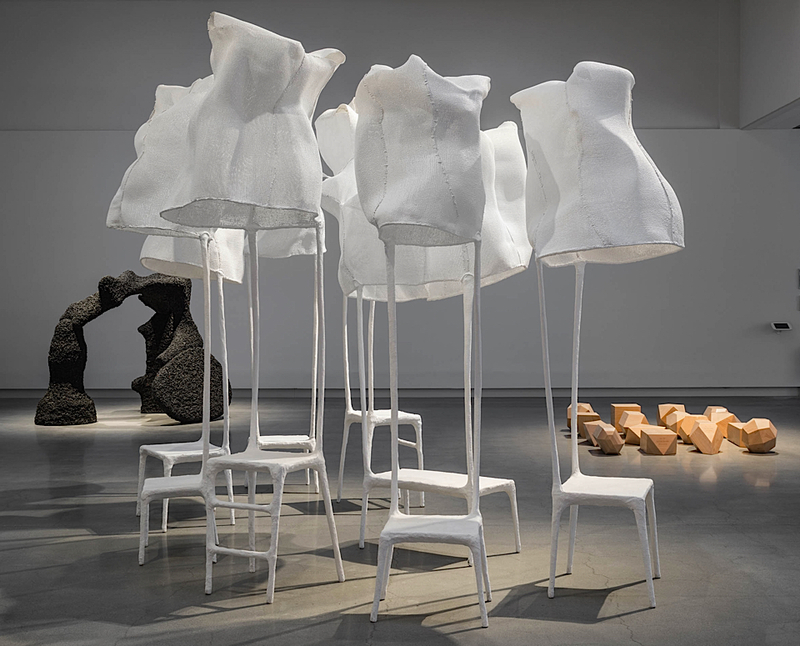 'EARTH MATTERS' alerts us to consider how we over-consume our resources, but it also celebrates the beauty of these natural elements that are ingeniously reinvented by contemporary designers and textile artists. A press preview takes place at 12:00 on Thursday, July 19. Vernissage with invited guests on Friday, July 20. 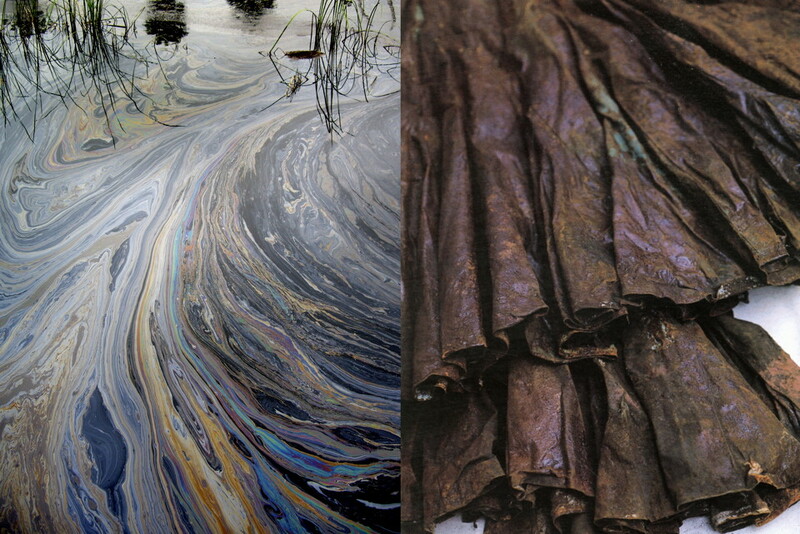 A textile conference with Lidewij Edelkoort and other speakers will take place on July 21. The Earth is hurt and emptied. It feels raped and shackled. Its fossil fuels and resources have been taken and many of its stones, minerals and metals are gone. 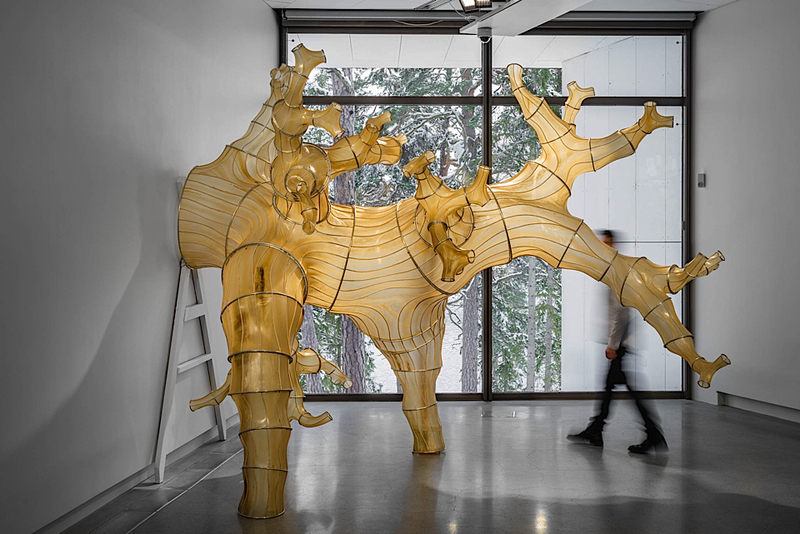 Materials have been transformed into buildings and forests have become furniture. Water is spoiled and food is spilled. Fields lay waste and jungles have been untangled. Coral reefs lay under attack. Carbon emissions demand to be reduced. We have taken it all and it is still not enough; turning materials into waste that we give back to the Earth as a poisonous by-product and as an unresolvable mass. This young century will bring about an opportunity for reflection and radical change, making up for a century of ecological abuse, overconsumption, greed and violence. For the first time, a post-fossil society is emerging, using natural ingredients, offering energy alternatives and giving us hope and faith in the future. Resetting attitudes towards more respect for the Earth and for one another. Our entente with nature will be rewritten and reconceived; people will try to live together in a more harmonious way, consuming less and caring for each other. Giving up ownership. 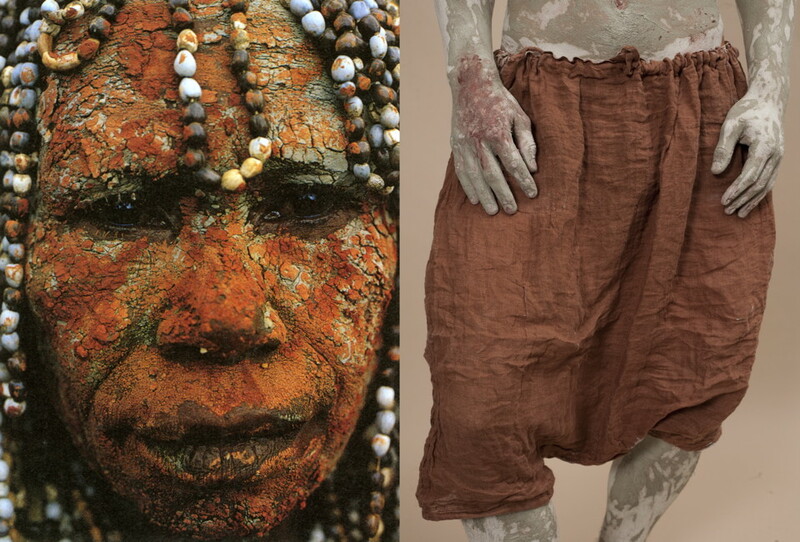 A more intimate and intuitive form of ecology will be the result, based on instinctive values, ancient rituals and archaic systems; rethinking primitivism, animism and fetishism alike. 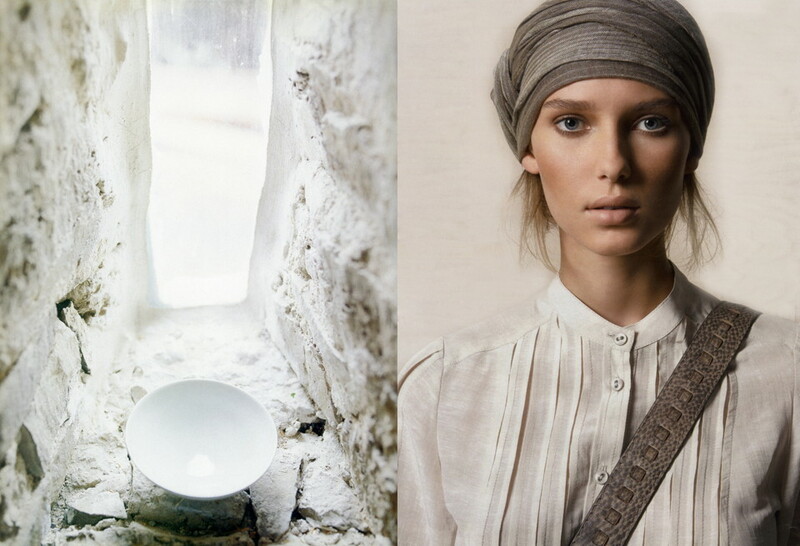 Design, materials, textiles and fashion mine inspiration from our planet; revering its beauty and resilience, bringing its struggle to our attention and contemplating its organic elements in awe, like true Romantics. 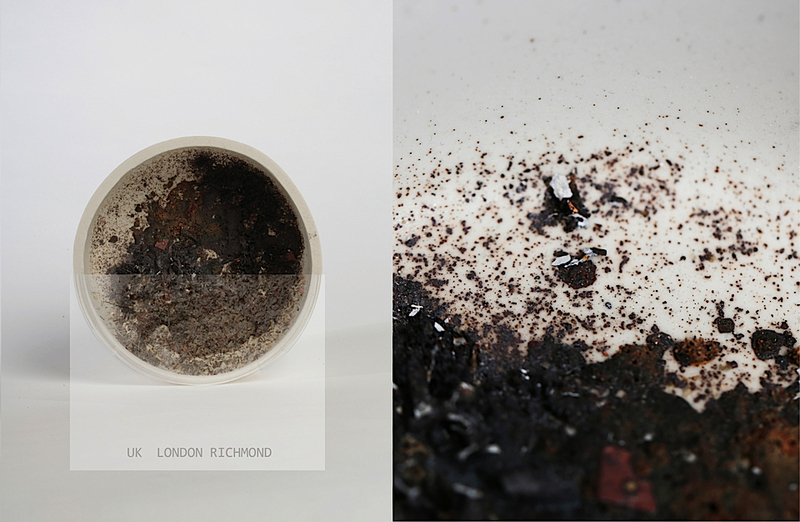 From land to sea, from forest to mountain, a wealth of ideas sprout from the Earth, analysing and cataloguing its components: transformed into textural materials, recycled remnants, oxidised alloys and vegetal colours; a movement redefining the tactile and emotional aspects of our life. EARTH MATTERS is our chance to bring together designers and artists that are investigating new ways of producing ideas; innovative thinkers that are able to turn around our mentality, progressive people that develop a body of work that leads the way to another world in the making – creating a horizon of hope. from June 10 to November 26, 2017. 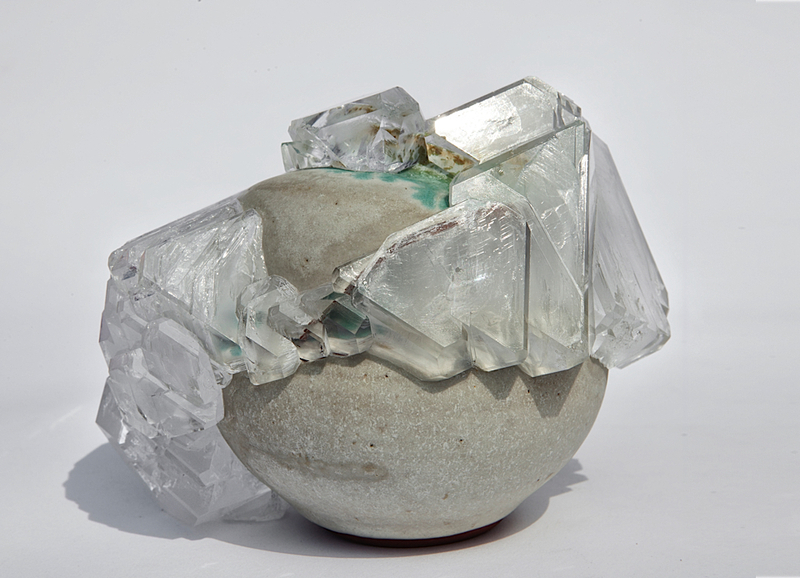 For Berlin based artist Lukas Wegwerth, crystals serve as a glue that gives a glamourous second life to broken ceramic objects. In some ways, Wegwerth is like a modern day alchemist. 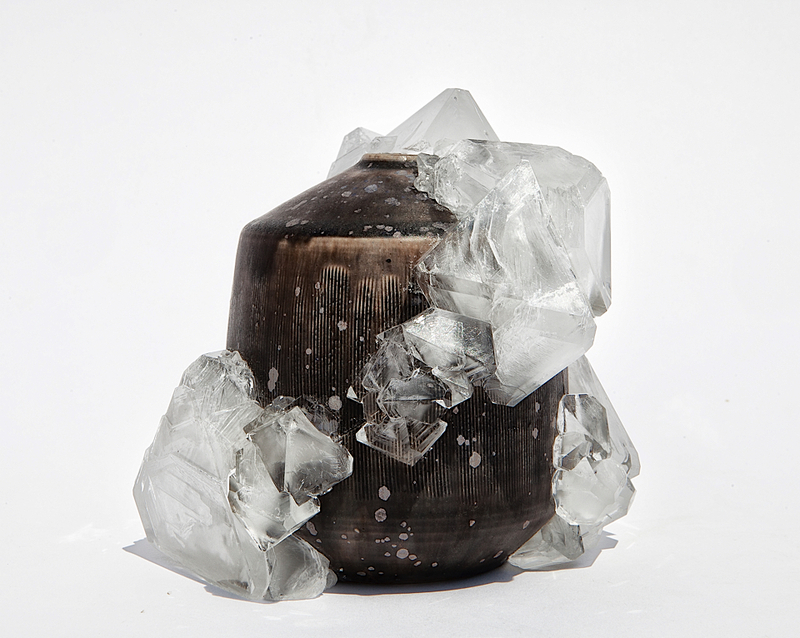 When looking for a solution to fix a favorite broken teapot, he became intrigued by the Japanese method of applying gold dust in the glue to purposely reveal the fissures in a broken vessel, and as such, elevating the object to a new status. 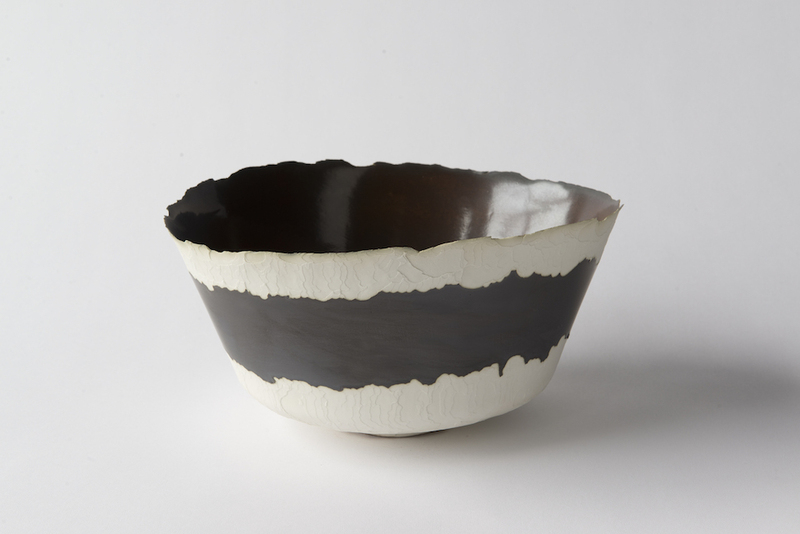 After lengthy research and experimentation, he developed a process of applying a special salt-based solution along the unglazed edge of the ceramic. Overtime the crystals flourish and expand in unimaginable ways, as if transforming, Terminator style, right before our eyes. 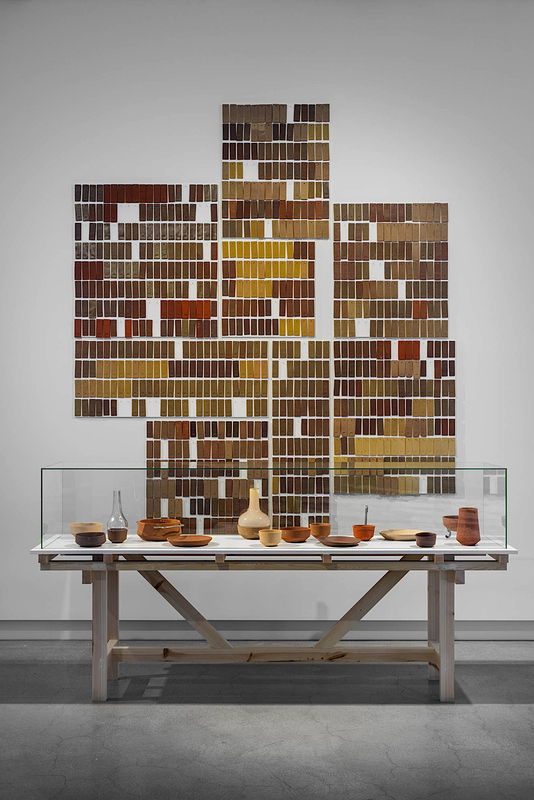 Reusing found objects, or upcycling, is a common practice in art and design; Old t-shirts made into a blanket or plywood planks from shipping crates turned into an elegant dining table for example, but broken ceramics seem a harder lot to revive. 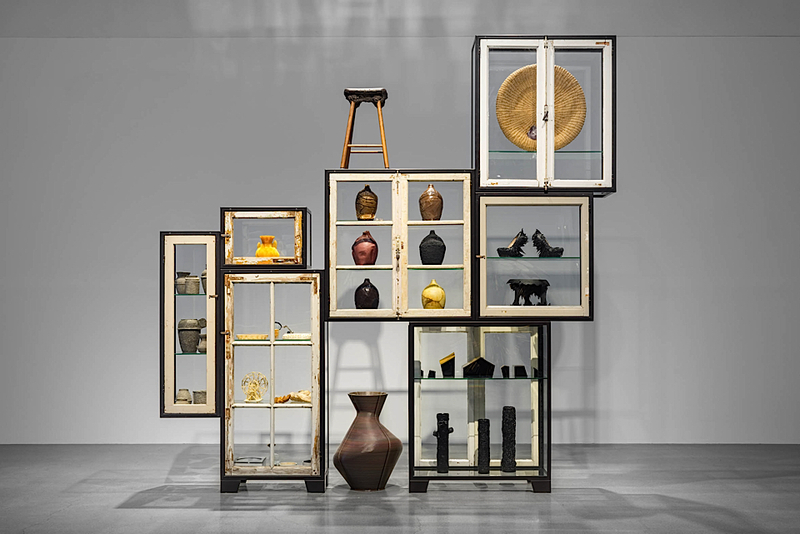 Yet there is a real value in repurposing an object in a beautiful way and Wegwerth is attracted to the idea of the history of an objects worth and its potential for rebirth. 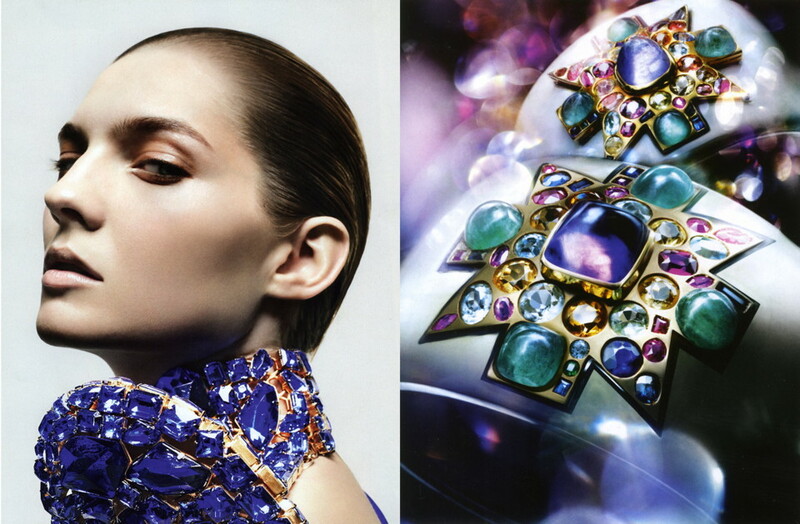 Each piece is uniquely its own with exquisite details, unimaginable formations, colors and textures. 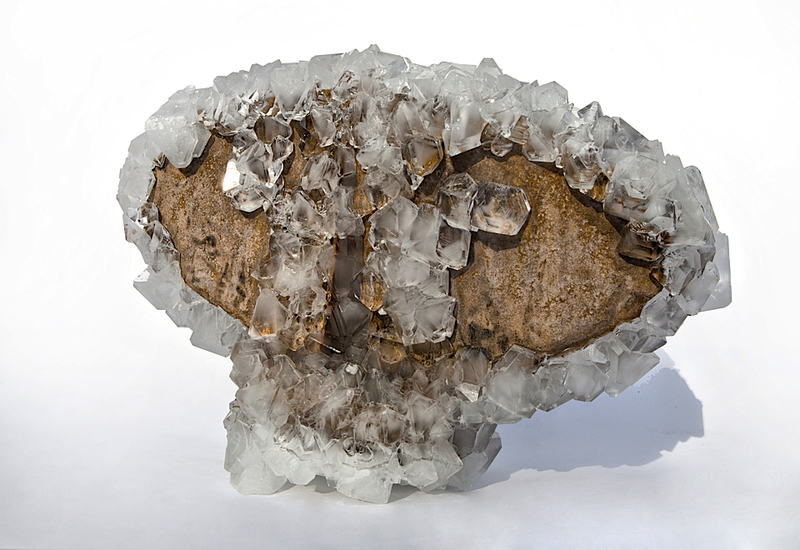 Beautiful and corrosive at the same time, crystals possess a mysterious and transformative quality that people are attracted to for many reasons, from inherent healing properties, magical associations, or just for their sheer beauty. 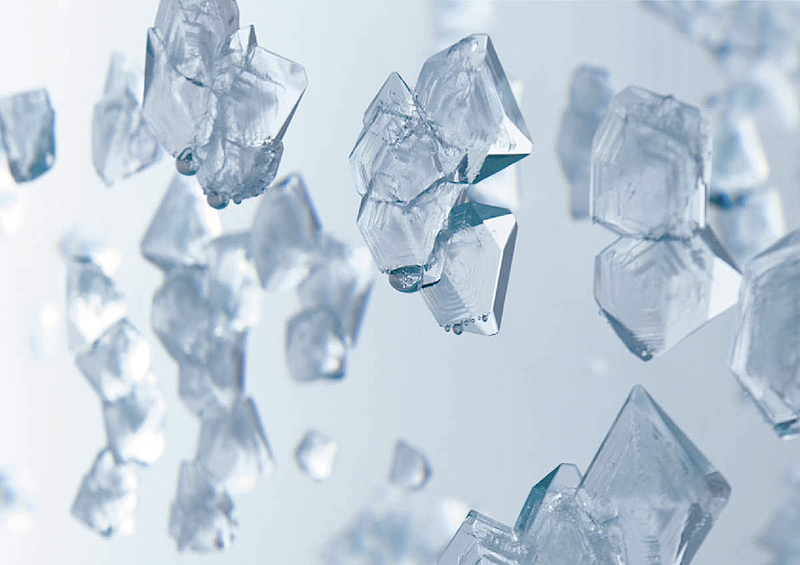 Crystals can add a sense of warmth to an environment, and render it more welcoming. 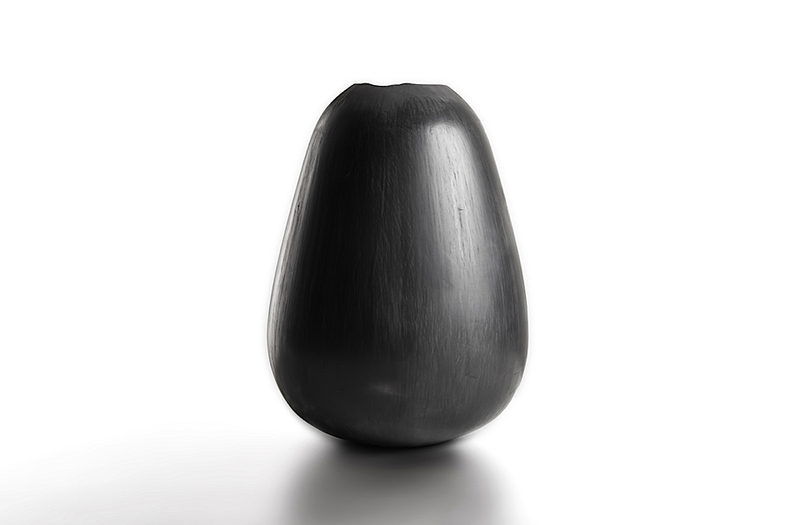 They are an ideal synthesis of science and the natural world, and Wegwerth’s objects have the same appeal. You want to touch it, possess it. The objects are tactile, inviting, explosive and inherently dysfunctional, and all of these contradictory qualities create a work that reveals as much as it disguises. The hybrid qualities feel relevant in our times as well. Transformation is in the news a lot these days, from gender related issues to altered realities, or even the possibilities with 3-D printing. 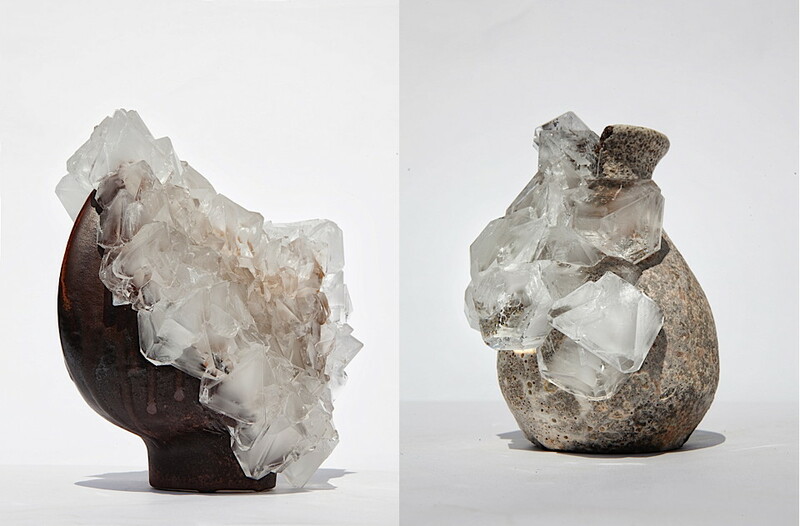 Wegwerth’s vessels evoke their own sort of hybrid-identity, a formerly functional, everyday object masked by exotic crystalline flora. 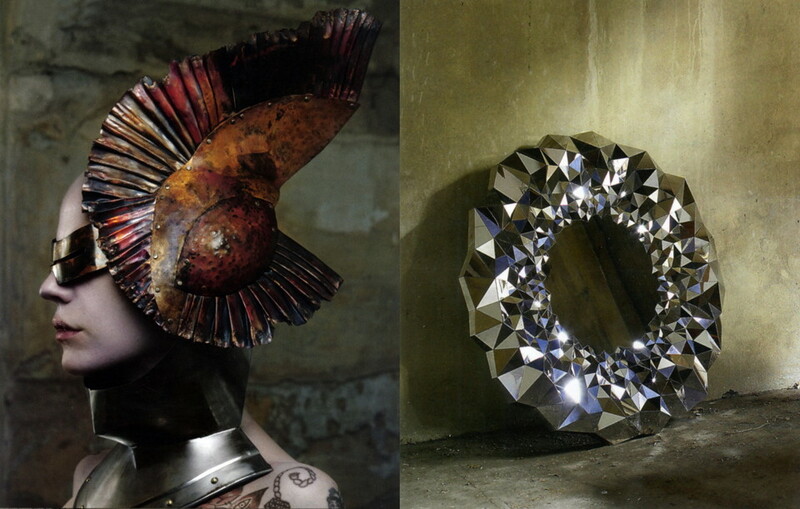 They are organic and manipulated, humble and baroque, art as well as craft. The crystallization process can take on different colors, from translucent white, pinks, lavender or deep burgundy. This is the result of using two different salts, one of which will be colorful and the other which creates volume. 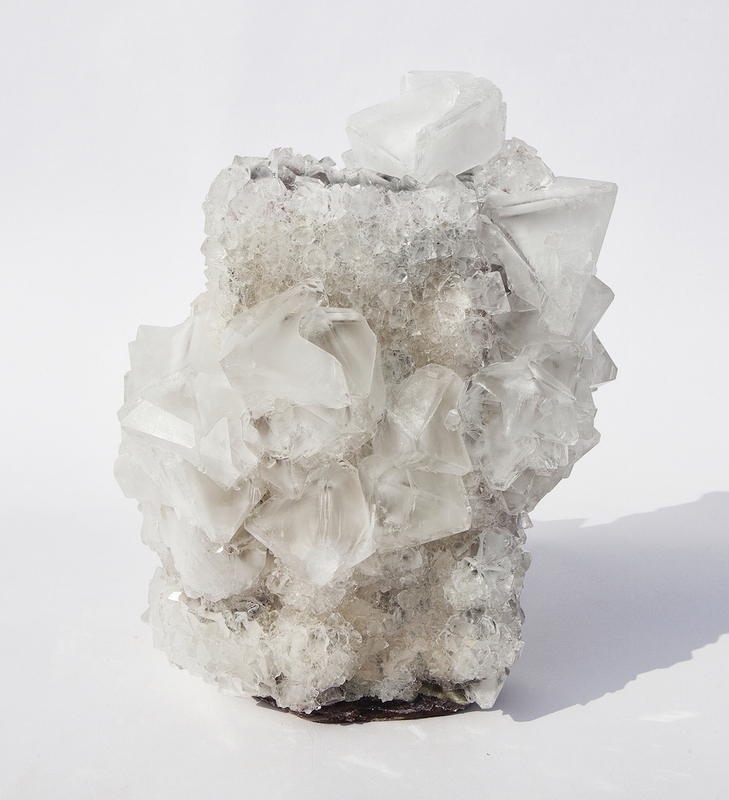 Though Wegwerth controls the growth of crystals as much as possible, there is an element of the unknown in this creative process. 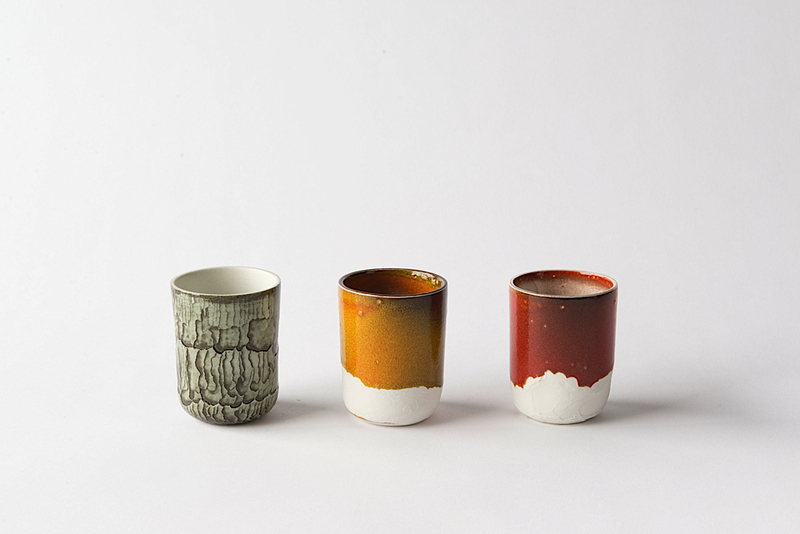 The salt can react with the glaze to make unexpected colors or formations for example, and because of this, he has been known to keep the vessels in his studio for lengthy periods of time, even up to two-years, to observe how they mature and settle, and often re-working a piece again and again to get the right results. 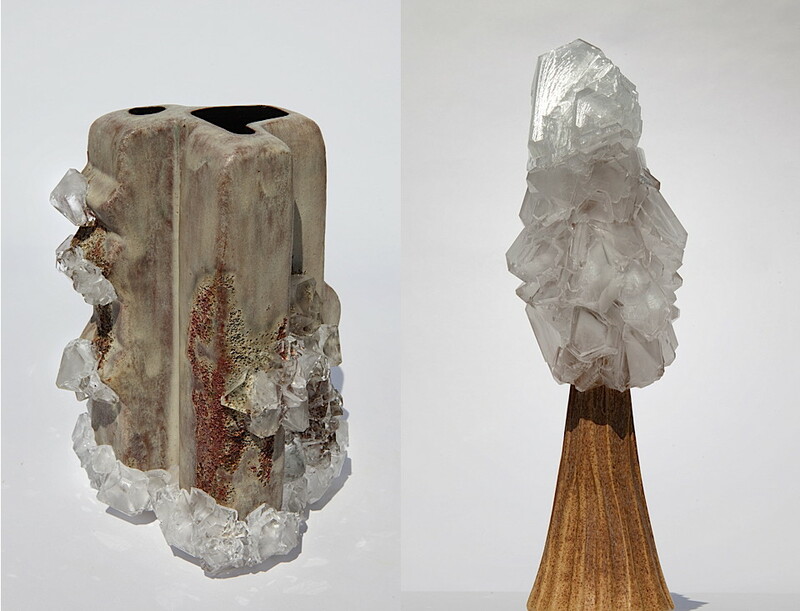 Recently he has found more interest in the transparent white crystals, preferring their reaction and appearance on the individual ceramic vessels. 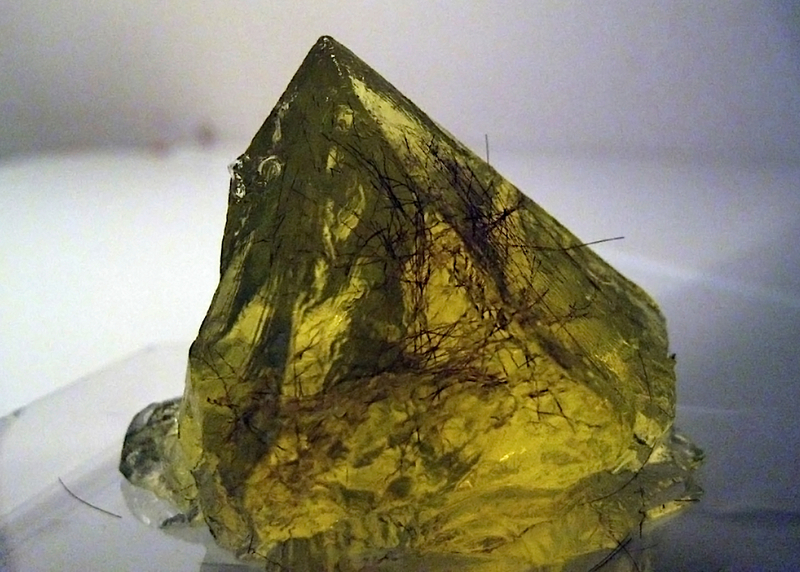 As his understanding of the crystalline process is evolving and he discovers new ways to control and direct the growth, he is becoming more fascinated with the possibilities of this unique material. It will be interesting to see how this project develops. Blaire Dessent is an American in Paris working as a cultural writer, copywriter and translator with a specialization in the cultural and lifestyle industries including contemporary art, design, fashion and beauty. She is also special projects manager for American design at Triode, a leading design showroom located in the 6th arrondissement in Paris. 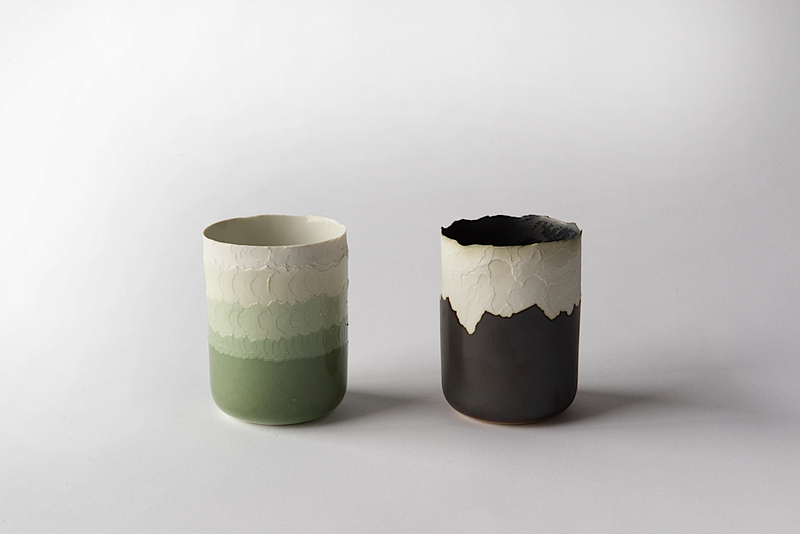 Porcelain objects shaped by fire and water. Studio Floris Wubben designed an installation inspired by the solar system with which unique textures can be created in sequence. 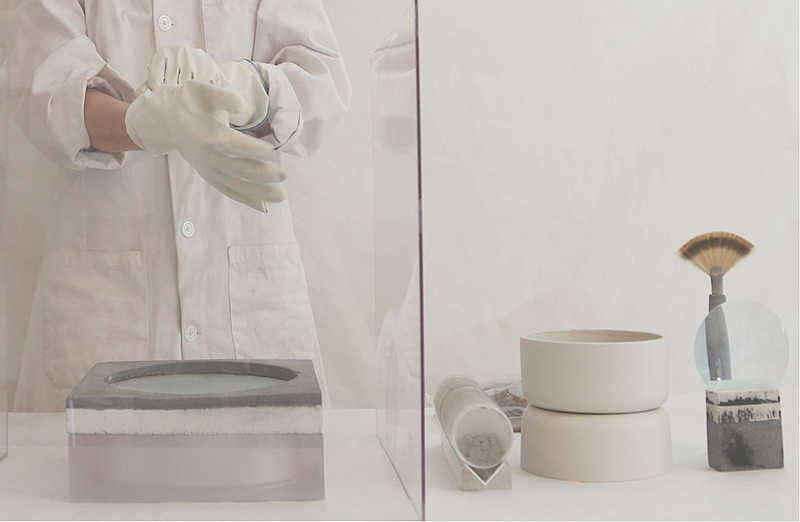 Within this installation, a gas burner’s flame etches a texture onto an unbaked porcelain object. 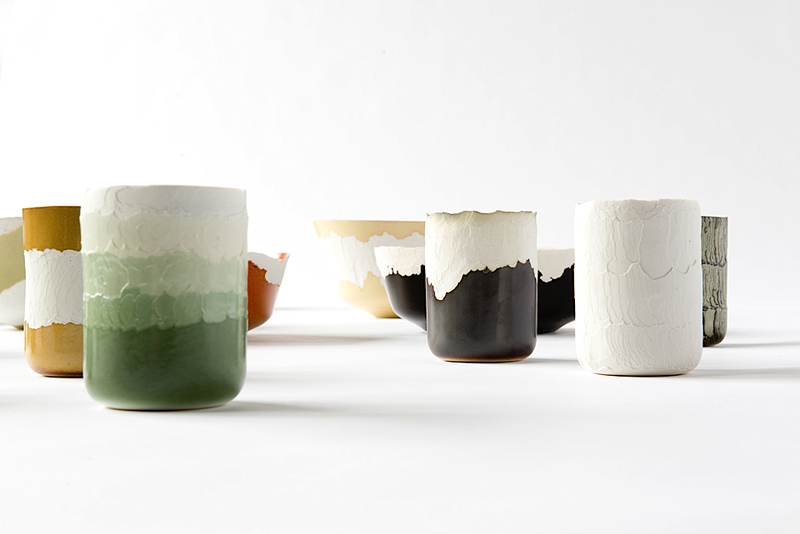 The porcelain reacts to the high temperature, causing various layers to burst from the object. By combining different glaze techniques with this etching technique, contrast arises in colour and texture. The distance between the porcelain and the flame, as well as the speed at which the porcelain object revolves in the installation, affects its final texture. The elegant shape of the bowl together with it’s raw texture, make an interesting and unique object. 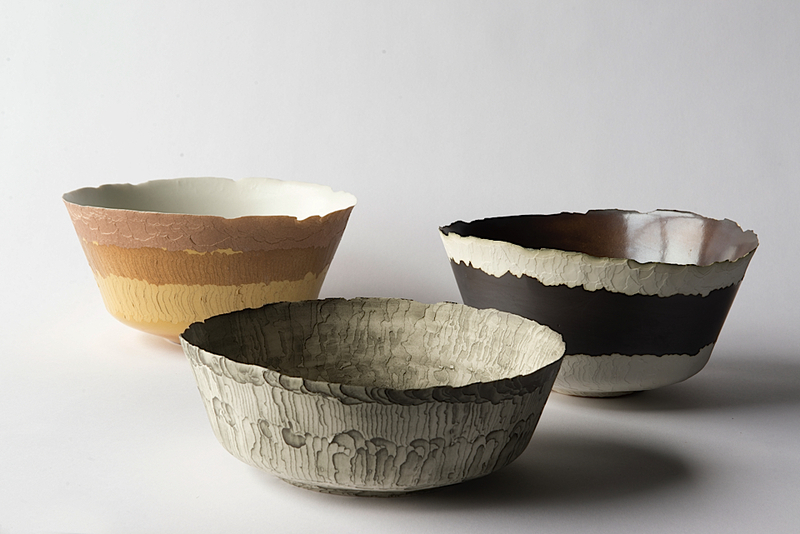 Erosion Set consists of bowls, pots and cups, and is a collaboration with Cor Unum ceramics studio. Roberto Sironi (1983) is an Italian designer, who graduated from the Politecnico di Milano in Industrial Design. After his studies he has worked with different design studios where he has developed his design approach. Roberto considers each project as a story, developed through research that involves different aspects, from rituals and anthropological references to historical memory, designing with a contemporary approach always appropriate to the context. He draws with the ambition to reveal the expressive potential of each material chosen, through a synthetic and minimal style, trying to reveal the poetry of the objects.Each project is a little journey, made by new discoveries and the people met along the way. Currently Roberto combines his design work while also working with the Department of Design at the Politecnico di Milano, as a researcher. 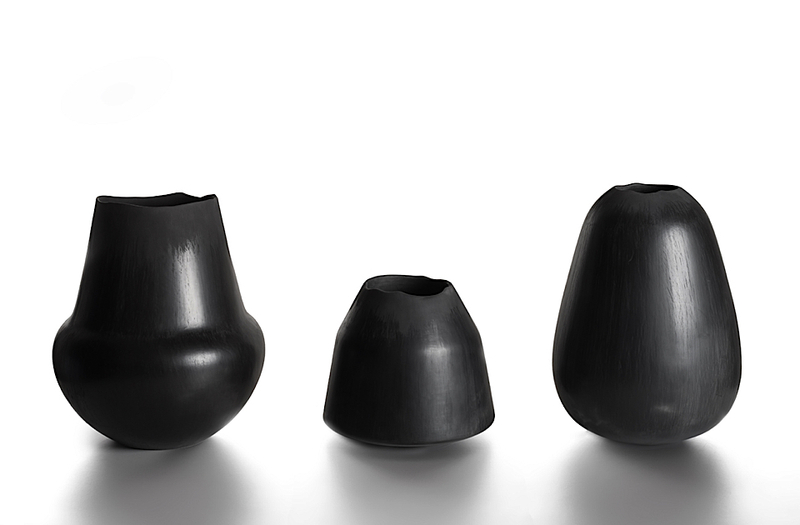 This collection of three vases is made with a technique created 8,000 years ago by the Etruscans. 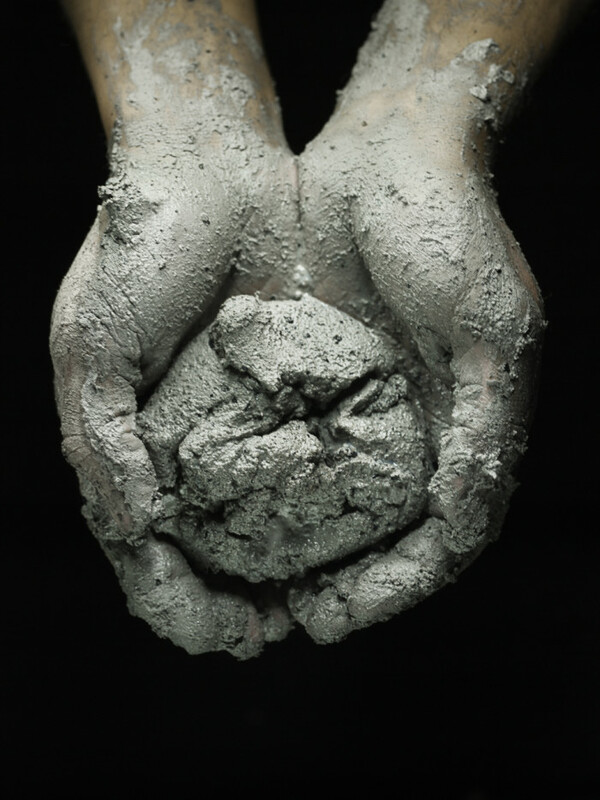 Bucchero is a clay that is baked at 900°C in a steel box where a chemical reaction occurs due to a reduction of oxygen and charcoal smoke present in the chamber of the oven. 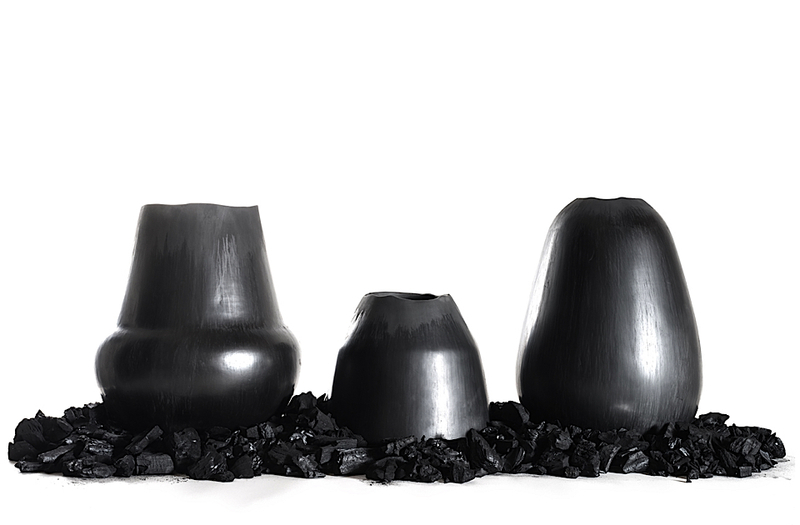 This process gives the vases their typical black colour with silvery shades. Buccheri Vases are hand carved with special tools made in boxwood. 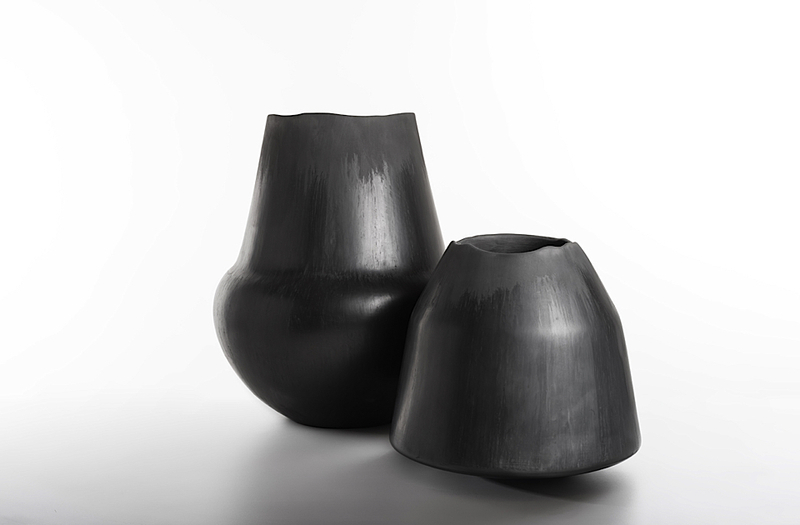 This process polishes the vase, leaving a rough finishing at the opening of the vase. 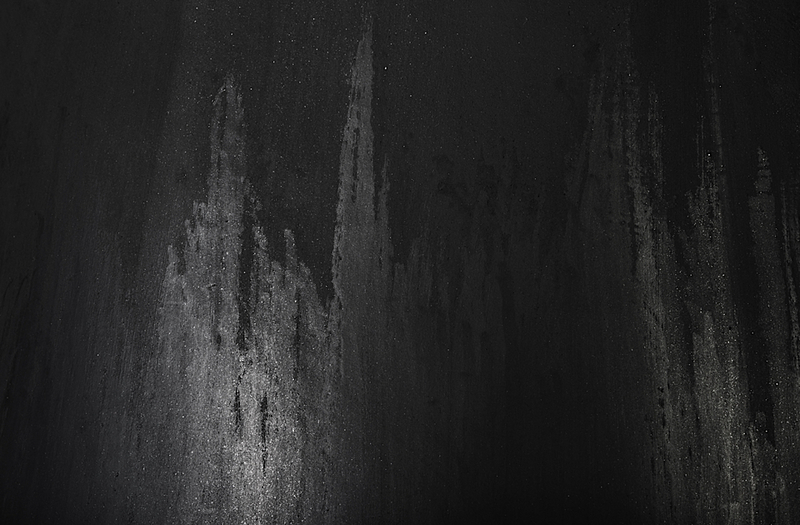 This technique gives the sophisticated colour variation from black to anthracite grey. 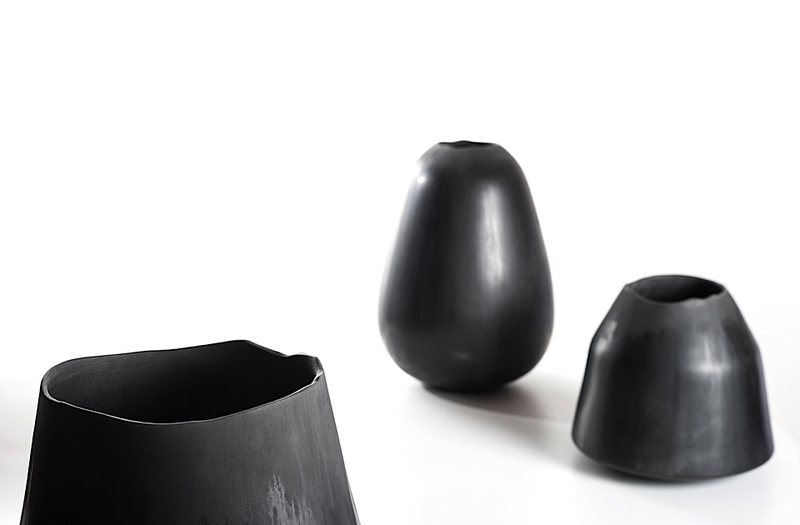 Minimal and stylish, these precious vases are designed to enhance the beauty of this material and each vase is unique, combining extraordinary tactile quality with a very thin thickness. 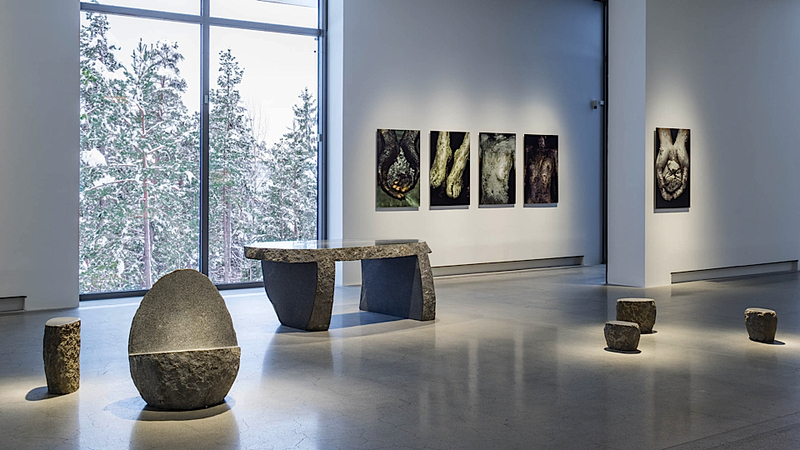 When invited by Artipelag to curate an exhibition just outside Stockholm, the organisation requested a site-specific concept, related to the landscape, water and earth. Several scenarios promised potential yet it became clear that this was our chance to bring together designers and artists that are investigating new ways of producing ideas; innovative thinkers that are able to turn around our mentality, progressive people that develop a body of work that leads the way to another world in the making – creating a horizon of hope. 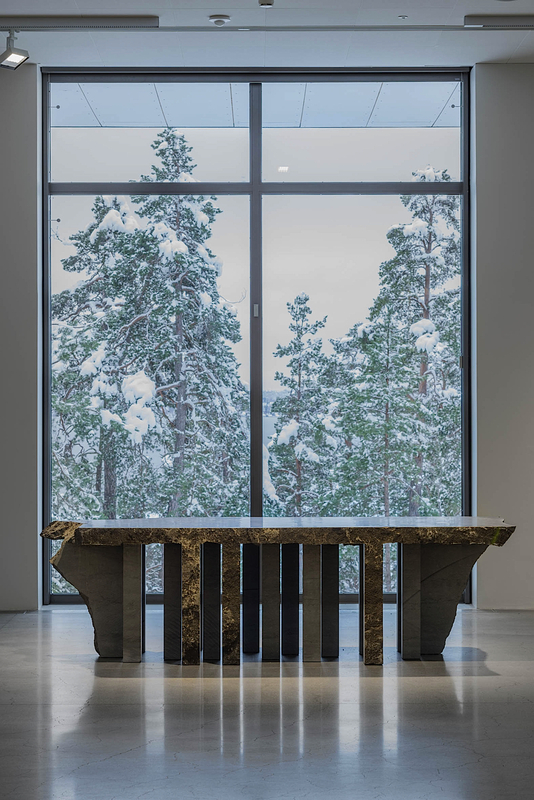 The extreme beauty of the galleries and its surrounding landscape can be seen as a friendly competitor to culture, a formidable aesthetic force to be reckoned with. Therefore we felt that as curators we should bend with this beauty, wave with its grasses, go with the flow of its waters. The installations are chosen to complement and commend the surroundings, merging emerging ecological design processes with the enchanting landscape. 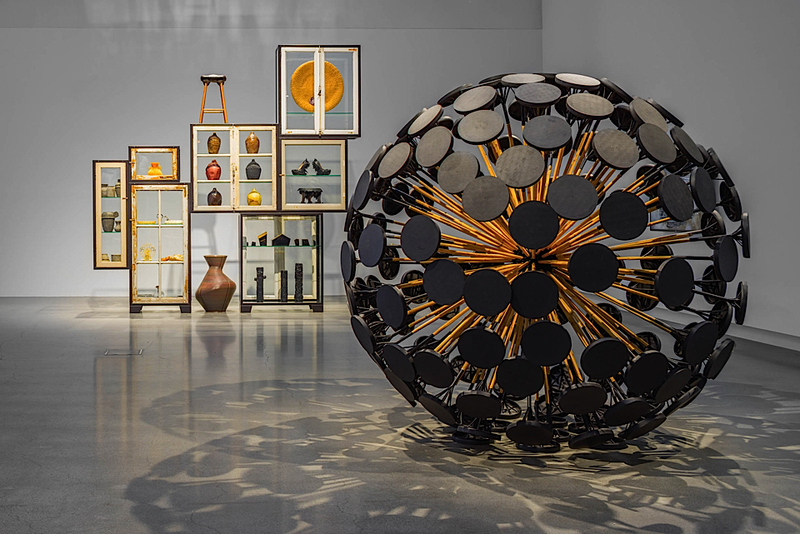 Most of the works on display are made with human hands and forged from natural resources, where these contemporary alchemists are transforming matter to give new life to old recipes and create new perceptions. Landscaping the design like archipelagos and almost islands enabled us to bring together a generation of thinkers that lead the way to another world. For too long we have ruthlessly consumed our Earth's assets and drained it of its resources. Forests become furniture, oceans are polluted and minerals are over-mined. For future generations it is crucial to consider a new reflection: a transformation from over-consumption towards sustainable development that is in harmony with nature, with increased respect for our environment and for each other. 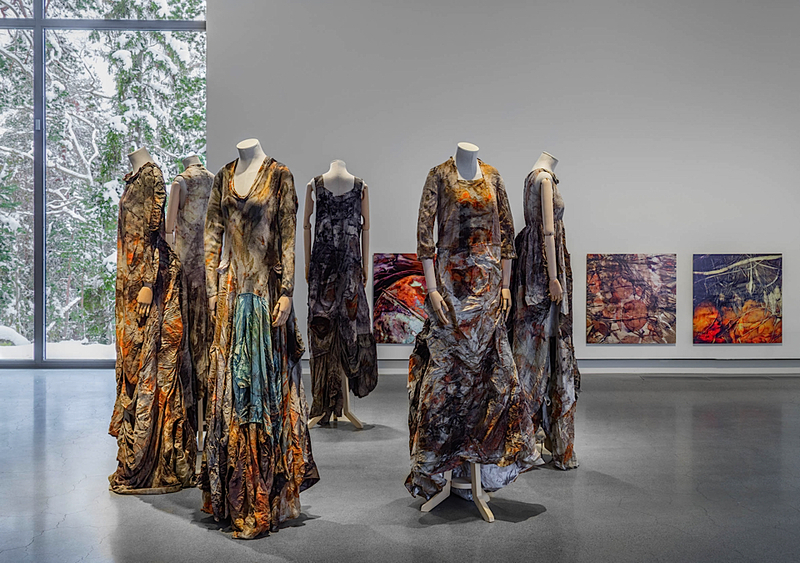 Areas such as design, art, photography, food and fashion are increasingly driven by a new creative energy that is inspired by natural materials and sustainability. 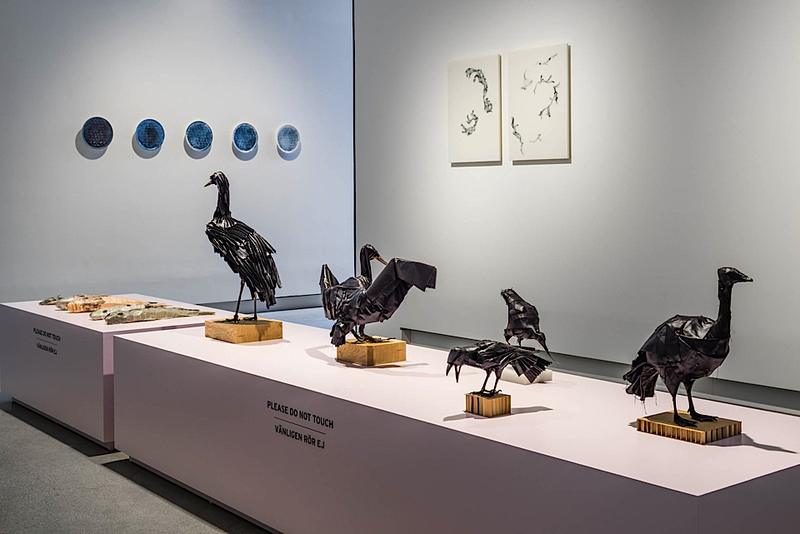 From land to sea, from forest to mountain, a wealth of ideas sprout from the Earth, analyzing and cataloguing its components: transformed into new materials, recycled remnants, oxidised alloys and vegetal colours. The exhibition EARTH MATTERS alerts us to consider how we over-consume Earth's resources, but also celebrates the beauty of our planet. 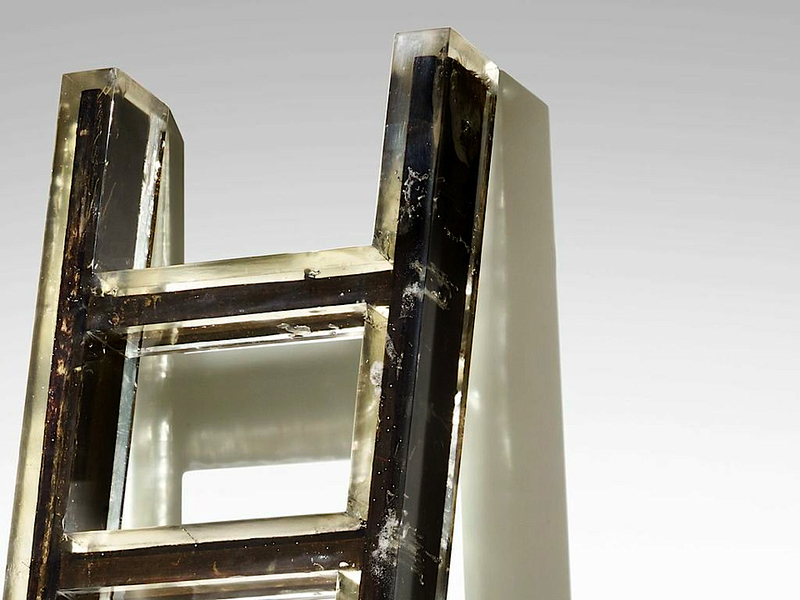 Lucie Libotte is a designer who uses material as a starting point for wide-ranging explorations. 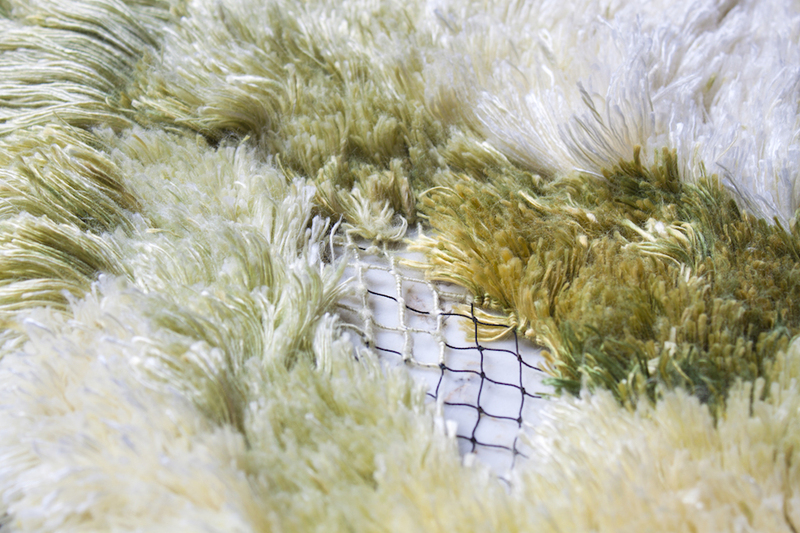 She is from Belgium and graduated from BA Textile Design at Central St Martins. 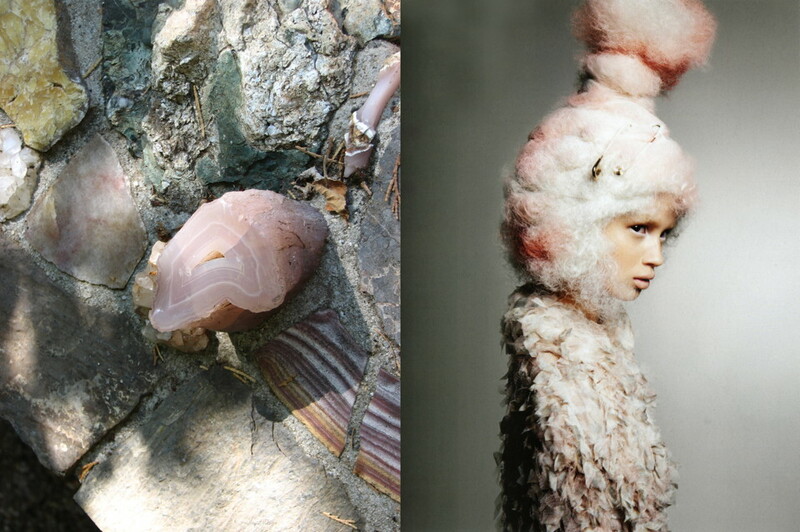 She began exploring how we interact with textiles and how this changes our perceptions and ideas of our surroundings. 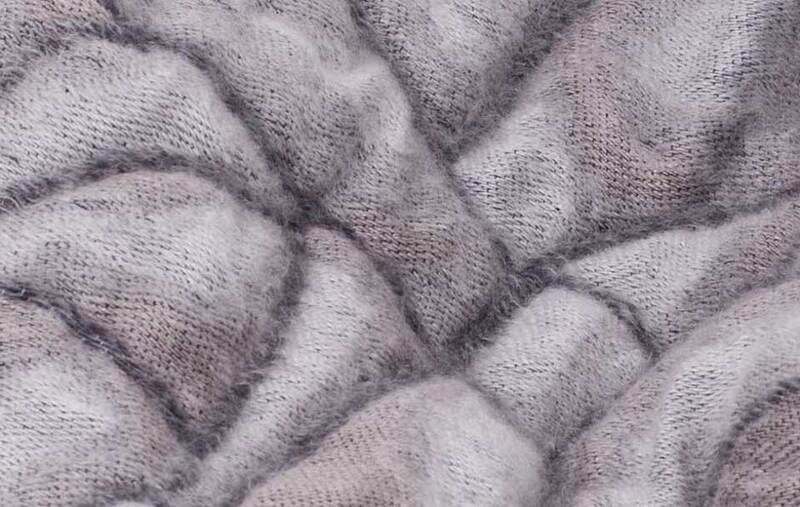 In the course of her MA in Textile Futures, she discovered the importance of the fundamental origins of materials. 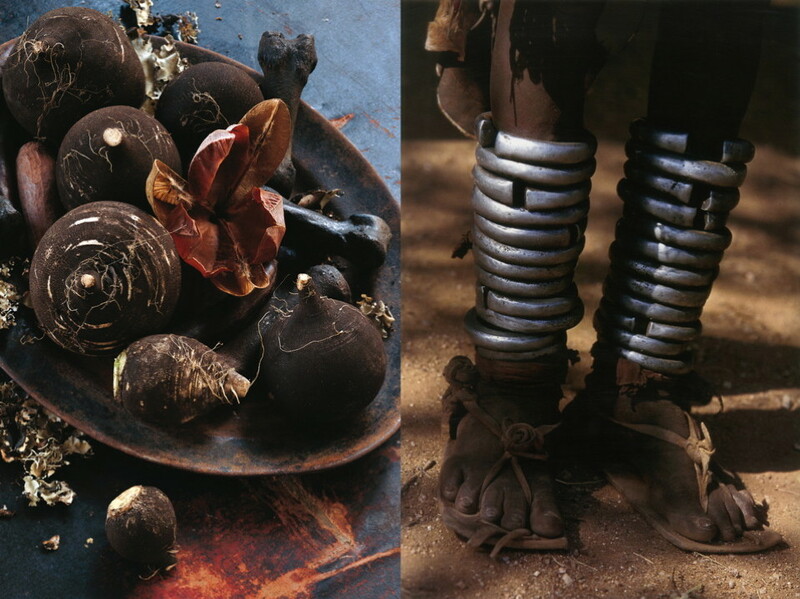 As Libotte says : "I am interested in the materials origins as a representational system." 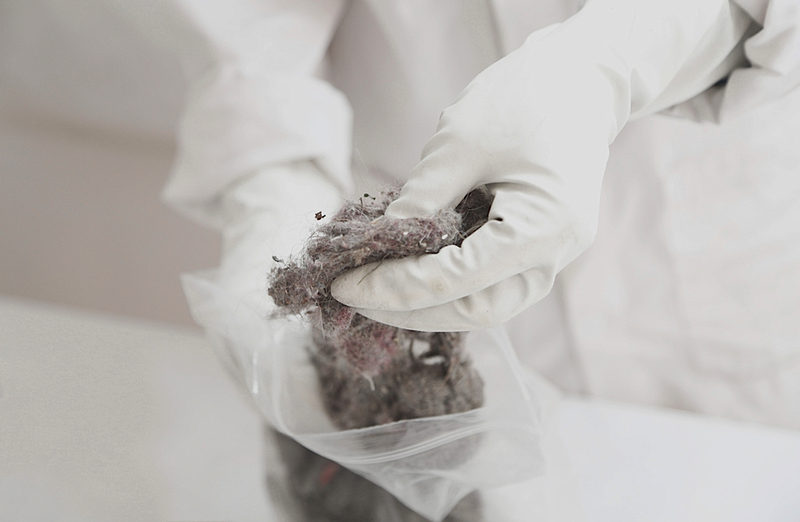 House dust is commonly perceived as dirty, intrusive and repulsive. 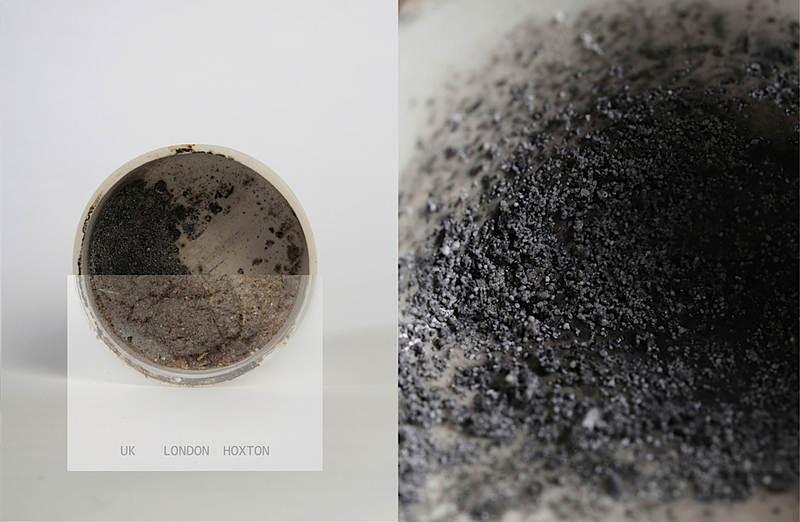 We know it as fine grey dry powder consisting of tiny particles and waste matter collecting on surfaces or carried in the air. It is often associated with unkempt and neglected environments, where as a clean environment is considered as civilized and proper. 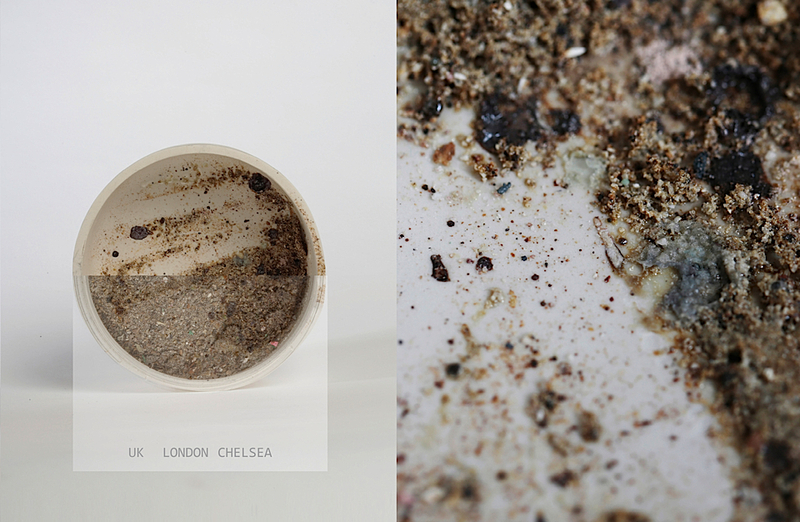 ‘Dust matters’ aims is to re-evaluate this ‘dirt’, and convey the value of dust as an indicator of our environment, showing how it reflects our daily life and traces our journey through the world. 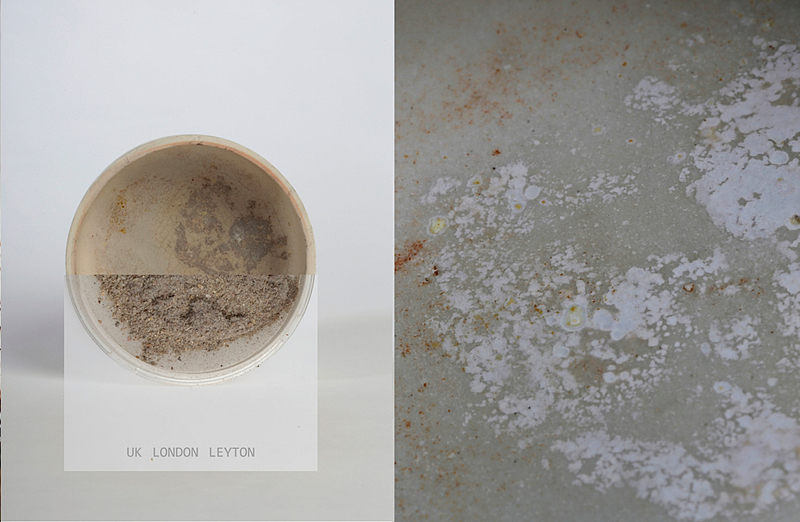 Focusing on the individual’s private sphere as the research arena, Libotte collected samples of dust from various homes, observing and analysing the different inherent components. The physical value of those components was discovered to be substantial. 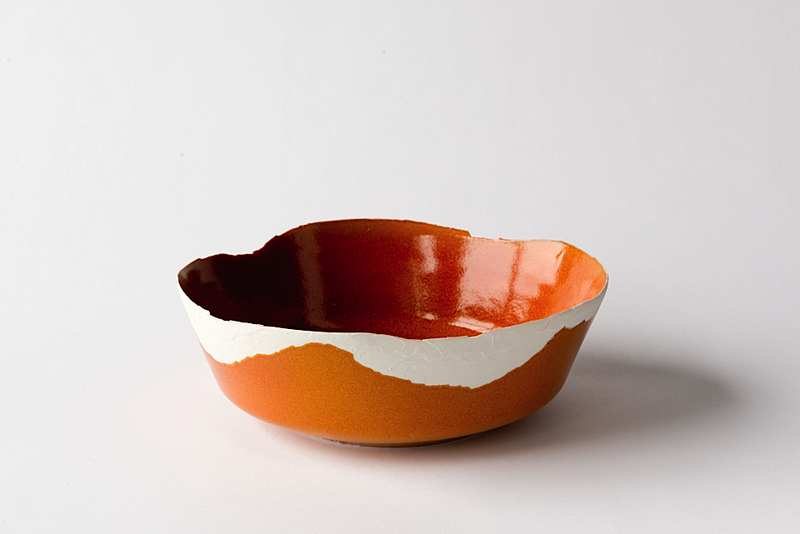 This value is brought to life with as an unusual coating layer on ceramic objects. 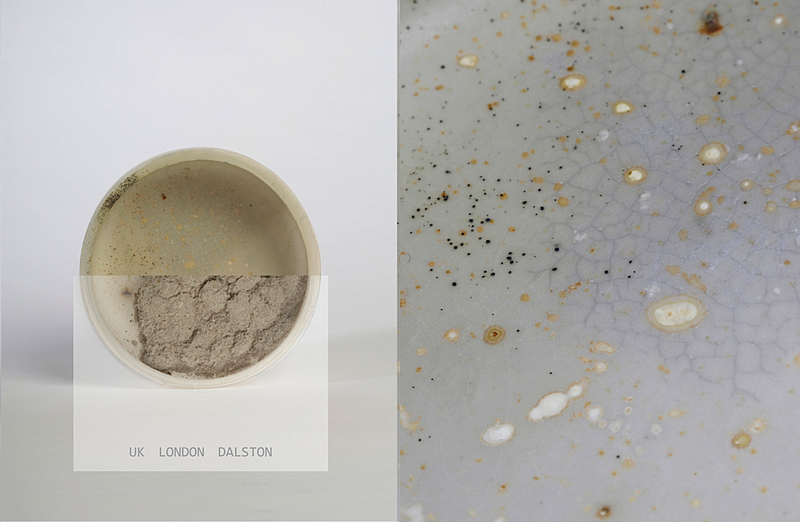 Using “dust matter” technique, she created a range of bespoke vessels that display the different sampled environments, and ultimately tell a story of their origin location. Dust Matters is definitely not a concluded project. In fact, Libotte considers it to be at an early stage of its progress. For its further development, she would be interested in finding a space not only to work but that could also simultaneously inform the making of new body of work. This would allow her to create a design piece(s) that relates to that space, both in regards to the dust properties and the historical narrative attached to the setting. 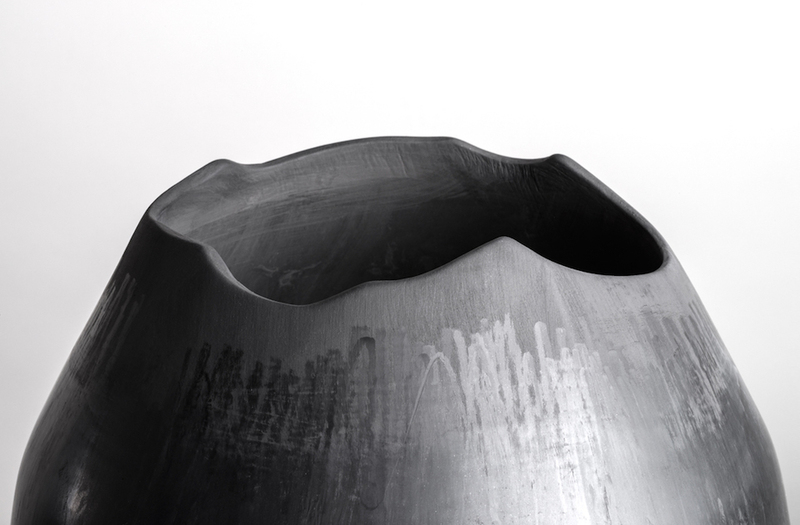 Italian designers Nucleo make objects that are at the crossroads between art and design. 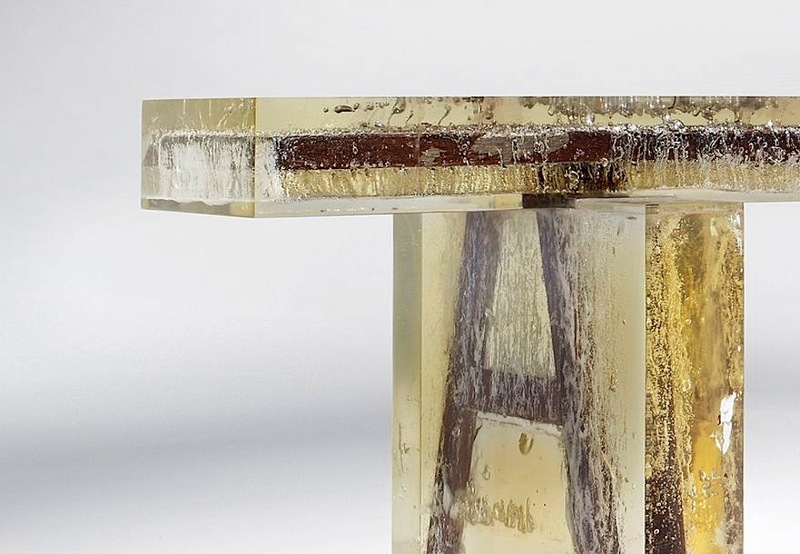 They often use fiberglass, pigment resin and carbon-fiber in their pieces, resulting in a very raw aesthetic, between minimalism and organic matter. 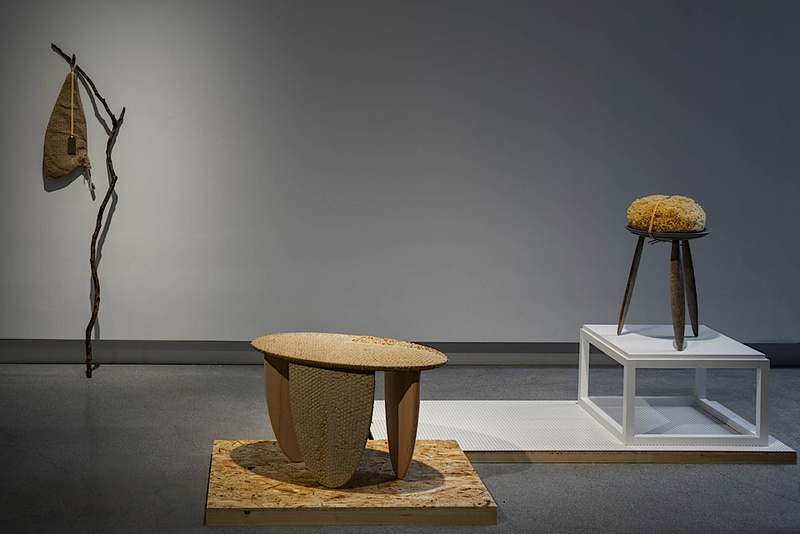 Using names such as the “Souvenir of the Last Century” bench and ladder (2013) and the “Wood Fossile” console (2012) and stool (2012) for their pieces created for Ammann Gallery in Cologne, Nucleo like to evoke memories and blur the line between manmade and earth-made. 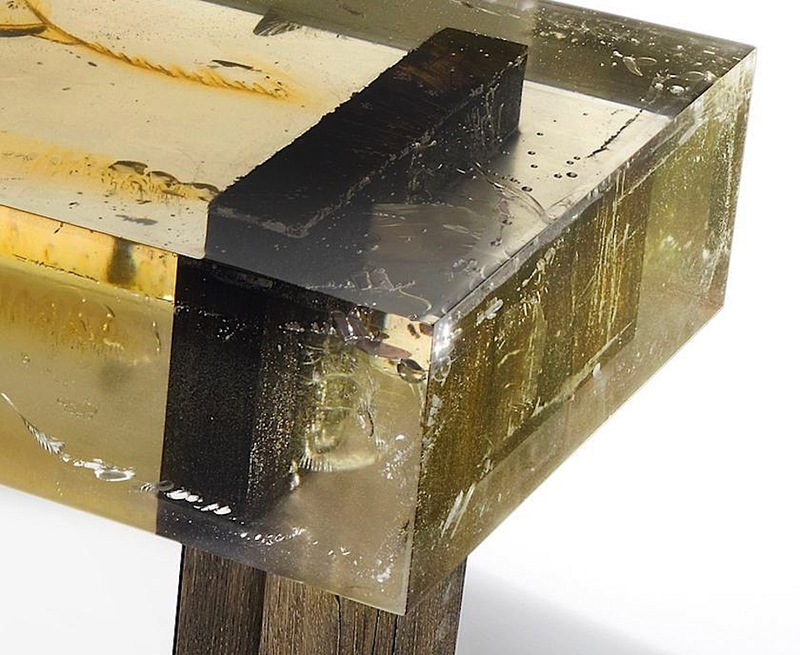 They trap impurities and pieces of wood in smooth blocs of resin, whose texture and inclusions can be reminiscent of amber – itself a resin which has been fossilized by time and nature. 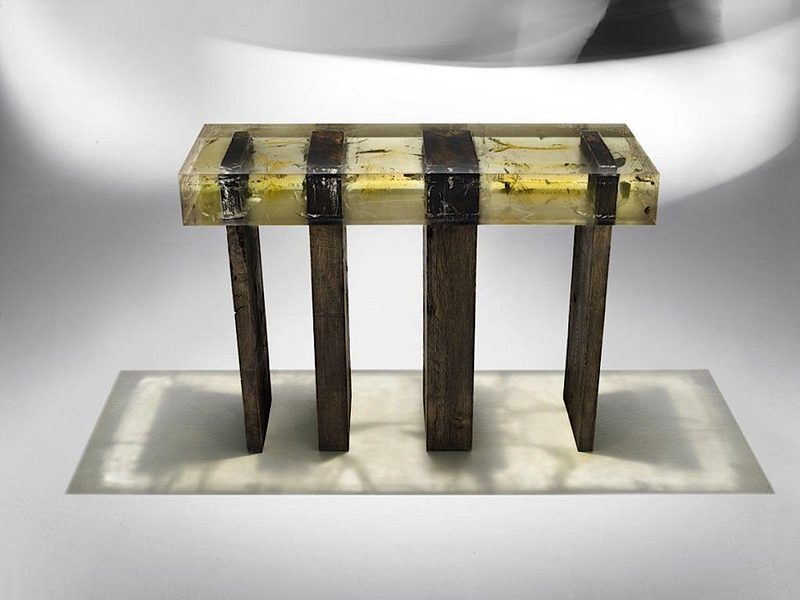 Found, up-cycled wood and neat resin create a tension between the polished material and the disappearing fossil, forming objects that are visible but not fully touchable, manmade but decidedly organic (as if reclaimed by the earth), "full of scars'' yet seemingly eternal. 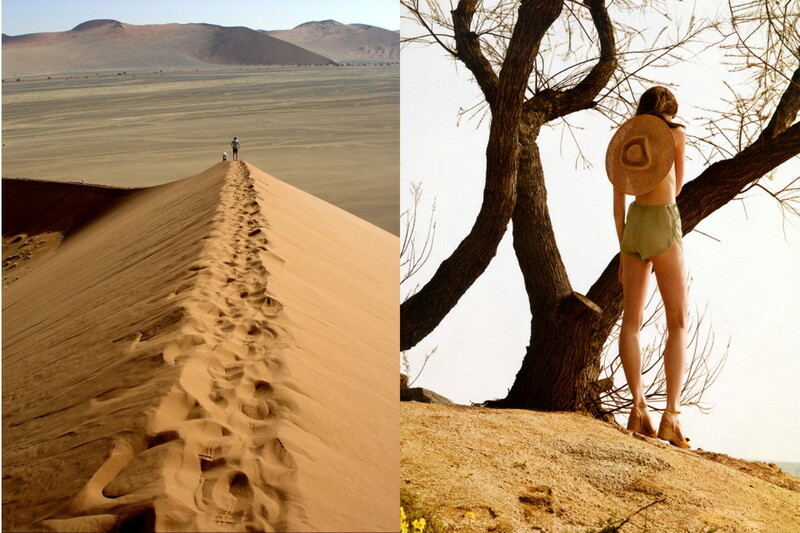 Mathilde Leblond is a UK-based trendwatcher with a passion for creativity, beauty and the future. 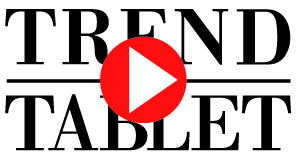 For Trend Tablet she contributes posts about some of the most arresting artists and creators which she scours the internet to find out about. 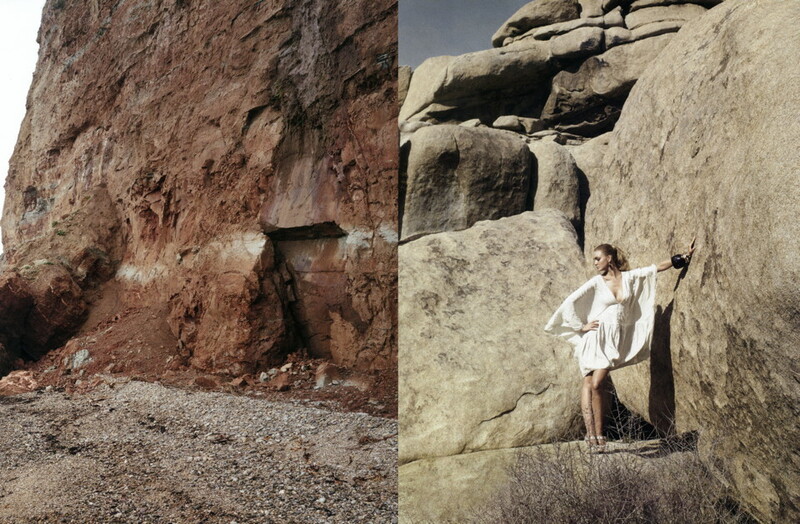 Dimitra Sotirchos is a trendwatcher specializing in fashion, arts & culture. With an MA in Innovation for Trend forecasting, she is currently developing a visual arts practice studying Environmental Art at The Glasgow School of Art. She has contributed to AnOther magazine and Dazed Digital and is also involved with the electronic dance music In London and loves yoga, currently training in Ariel yoga. Artist Emily Candela purposefully meddles with the ambiguous art of cosmetic medicine and hi-tech beauty trends through her edible artworks ‘krustapseudicals’.T here is a growing obsession with mortality and the visible signs of ageing. Realities of an organic ageing cycle can be escaped through a galaxy of cosmeceutical dolls. 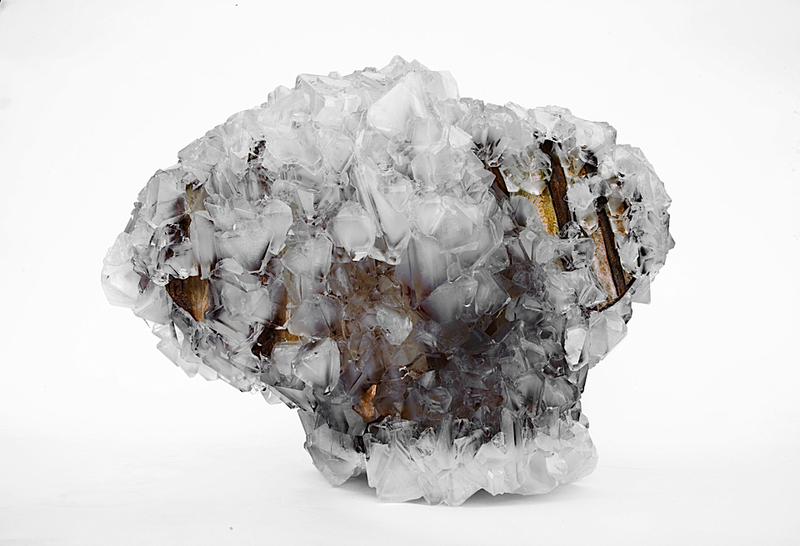 I spoke to Emily to find out more about her unconventionally beautiful crystalline objects. 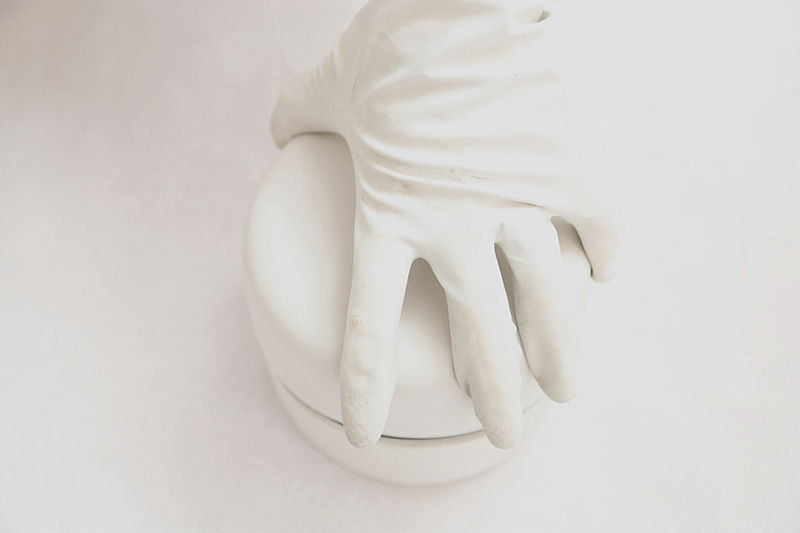 Where does the interest in Cosmeceuticals and beauty as a material & subject come from? I'm fascinated by the blurry line between what is living and what is not. I'm also interested in attitudes toward aging in the society I live in. Many beauty products promise a reversal or halt to the aging process that seems to respond to a desire, in effect, to be more crystalline than organic. To be frozen in time. I borrowed the prefix for krustapseudical from the Greek krustallos, for ice (which also lends its name to 'crystal'). What was your process for developing the crystals? 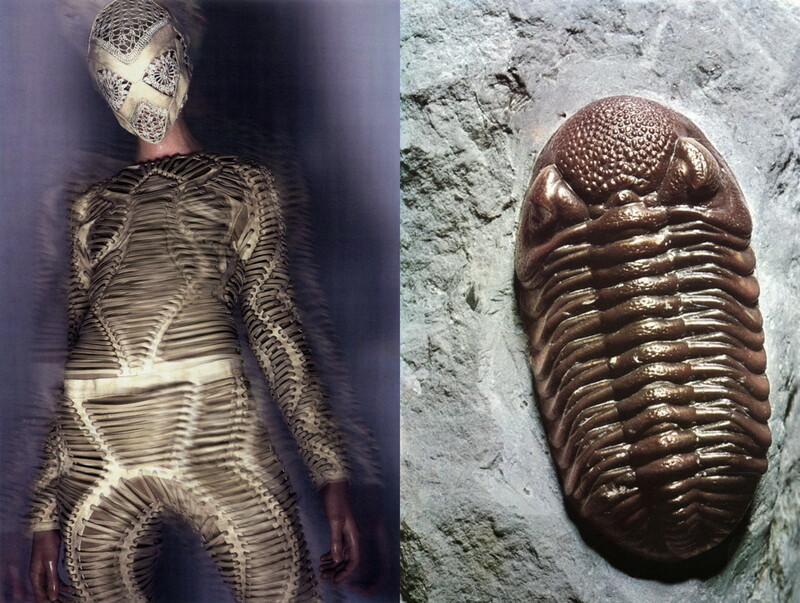 The krustapseudicals are crystallizations of beauty advice found in magazines. So they contain materials that are advertised as stalling the effects of aging on skin, hair or teeth - materials like vitamins, small amounts of minerals, proteins (via my own hair) and edible quantities of ointments for skin or lips. 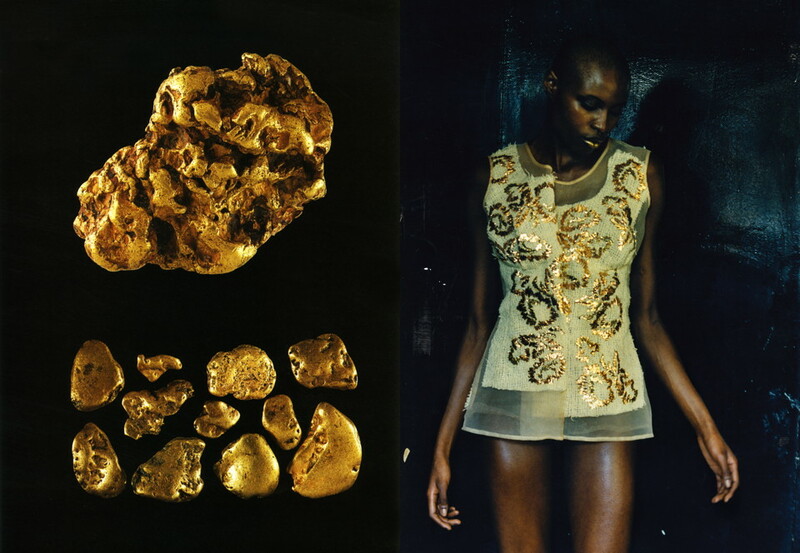 Other ingredients that go into the krustapseudicals are more poetic, reflecting the ideas or images associated with beauty and agelessness, such as gold and materials from the ocean. I have developed several krustapseudical recipes; each one is concocted and then cast into the forms of real crystals. 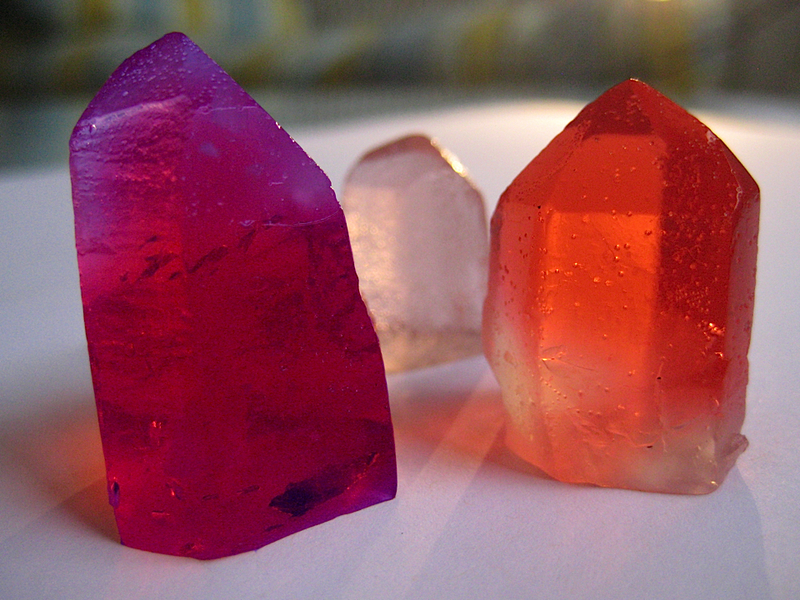 They have the consistency of jelly and feel rather 'organic' to the touch, even though they appear to be as solid as gems. What message did you hope to convey through the crystals? I’m not interested in producing a black-and-white critique of an industry or pointing out whether or not a certain type of product is marketed dishonestly. Rather, the project is about what the creations of the cosmetics industry tell us about ourselves and how we think about life and death. But krustapseudicals are ultimately about the experience of putting something in your body. They convey what any type of food, pill or vitamin does: an experience of ingestion that may or may not come along with a response to what is in it, whether that response is critical, anxious, relieved, satisfied or repulsed. 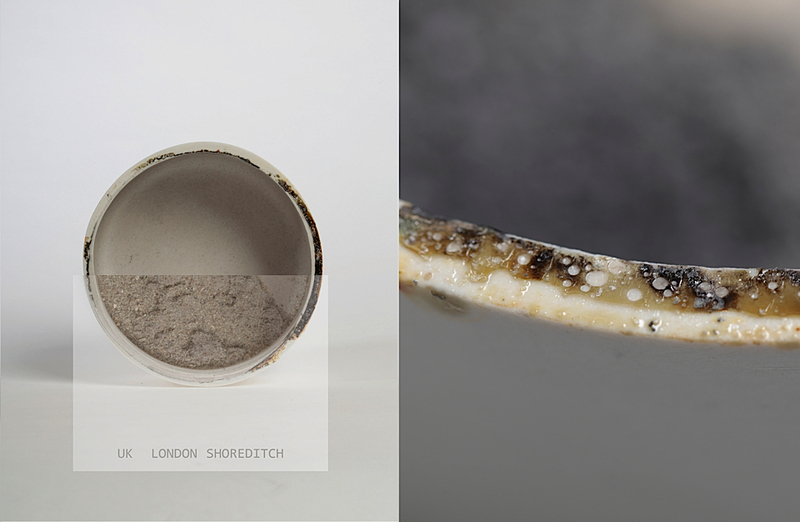 You created exhibited the work at the science-meets-art event ‘Does Dark Matter’ in London, were they a culinary success at the exhibition? What surprised me most was how trusting visitors were of me. More people ate the krustapseudicals than I had anticipated, given the semi-edibility of some of their ingredients. I went through hundreds on the evening. My art practice is now moving in the direction of involving more interaction with scientists. I'm happily turning in the lone-artist mode of working for one that's more collaborative. In fact, a current project involves me literally dispersing myself through the distribution of materials from my body. I'm also absorbed in my research into the interface of design and science, which I'm pursuing through an AHRC Collaborative Doctoral Award between the Royal College of Art and the Science Museum. There is a trend for collaboration and power in artist collectives. What artist collectives in London do you hold in regard at the moment? Cosmicmegabrain are working in a truly exciting way, ignoring the outdated boundaries between visual art, music, cultural research, theatre, and science. I’m looking forward to what they do next. 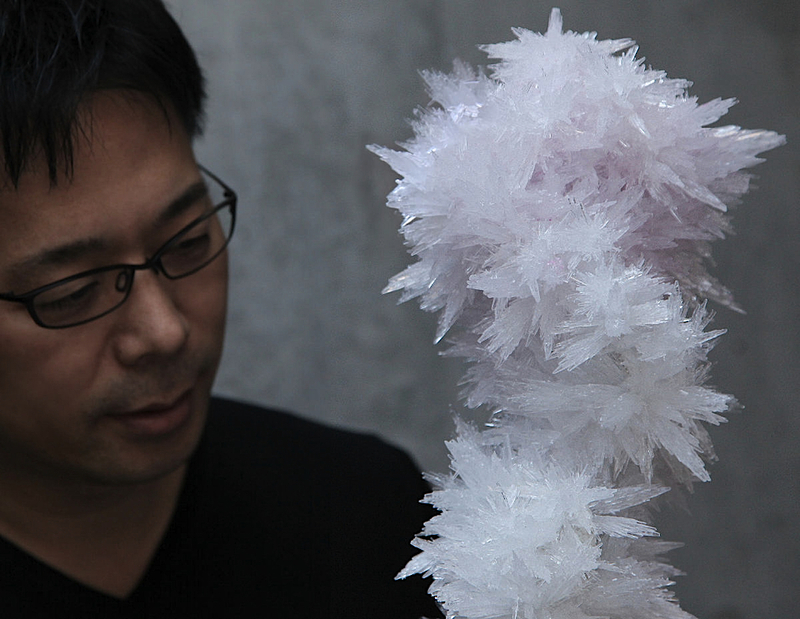 Tokujin Yoshioka is the “Creator of the Year” at Maison & Objet, Paris. This award is given to the most influential artists, creators and innovators around the world. 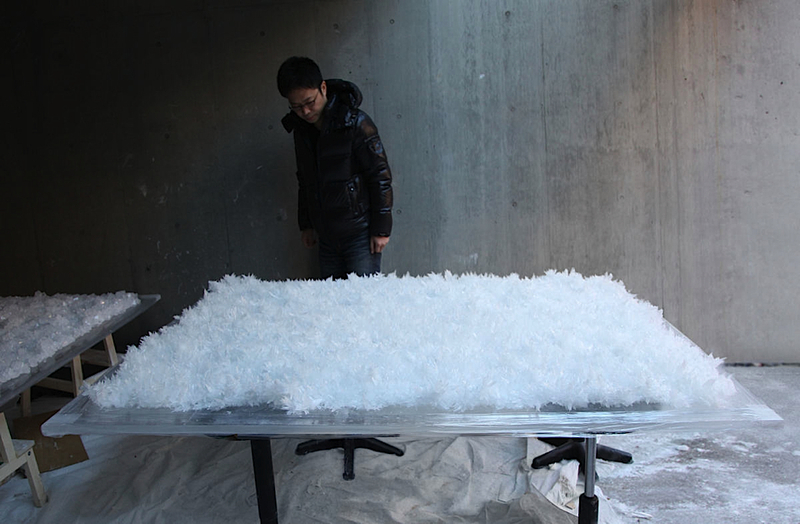 Yoshioka is showing an installation called, “The Crystallized Project ” at Maison & Object. 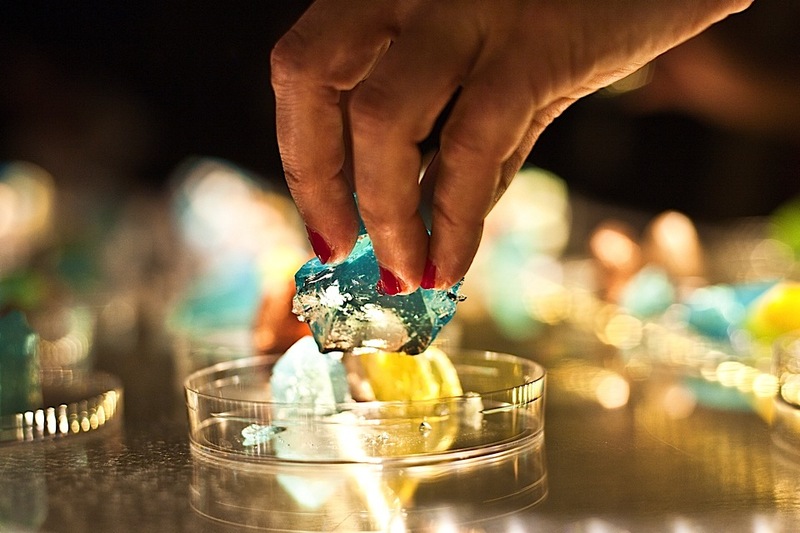 The exhbition includes Venus, a crystallized chair; a series of crystal paintings which have been grown using the vibrations of sound and music; as well as a selection of works that have yet to be revealed. Yoshioka’s is deeply interested in the future. 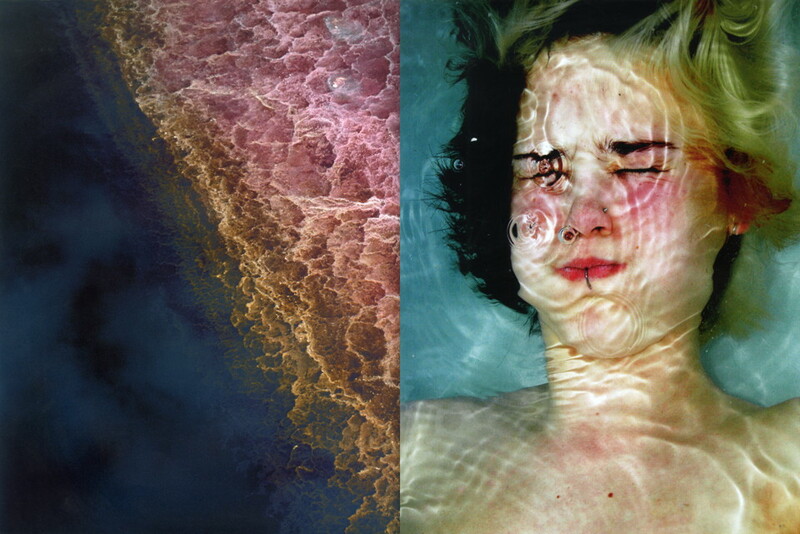 His work explores our relationship to natural phenomena. 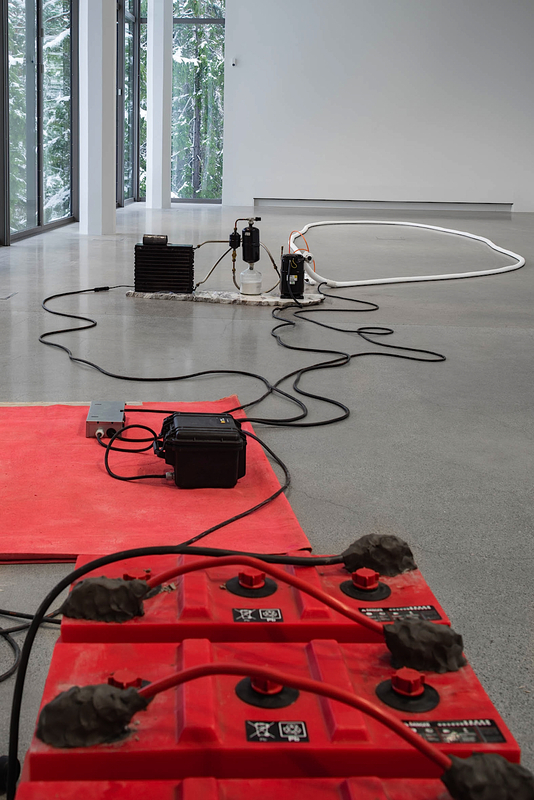 He seeks to imbue everyday, material objects with an increased sense of purpose and legitimacy, in contrast to the increasing number of virtual communities, spaces and places. A poignant reminder that the natural world is also home to beautiful spaces and places that increase human connectivity and collaboration. 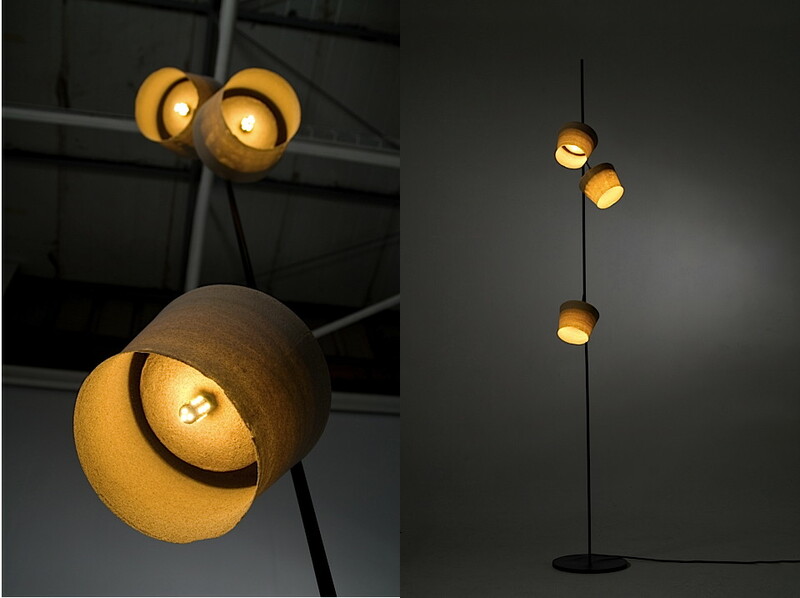 Nir Meiri’s collection of sand-molded, lamps are not only exquisitely designed, but also environmentally savvy. 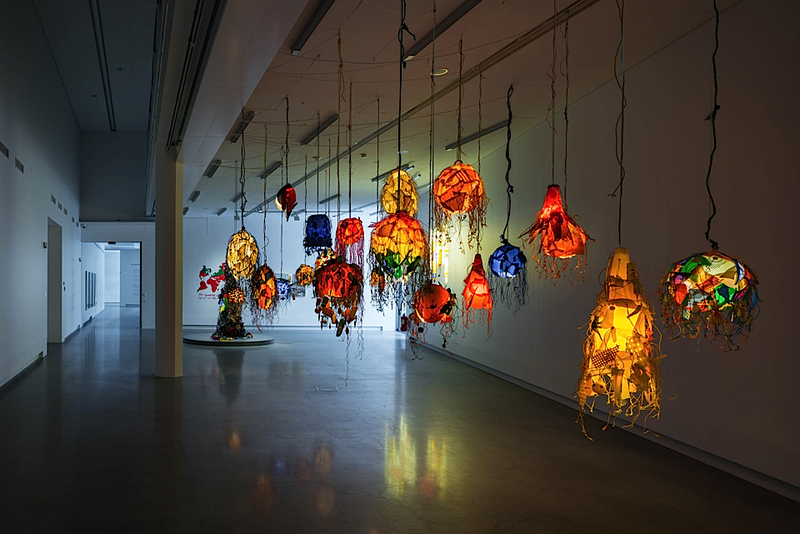 The lampshades are reminiscent of primitive desert structures, while their overall construction resembles the burgeoning fauna of the Mediterranean seashore. Meiri’s use of sand as a primary ingredient mimics the tension of its wild nature — that of sand storms and vast deserts — and the delicacy of the lampshade’s molded design. LED bulbs save energy, and sand remains an abundant raw material. 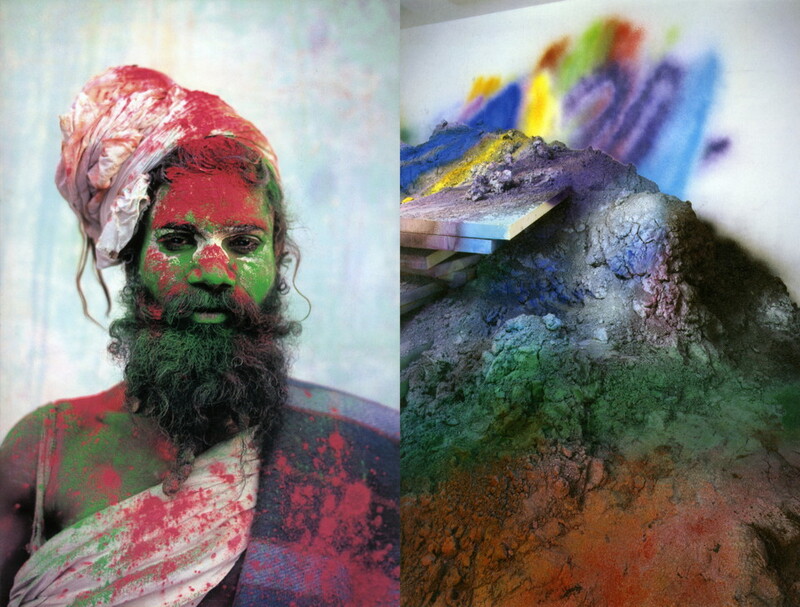 Born in Israel, Meiri’s use of sand is directly linked to his origins. His lamps are a prime example of the abiding connection between land and identity; an invaluable link between who we are, where we come from and the world we inhabit. she is talking loud and clear. she is protesting violently with frontal attacks. buildings and people like flies. she is spitting her anger in the air. she has had enough and is tired of accommodating further abuse. erupting volcanoes and multiple earthquakes are the result. she feels gang-raped and shackled. and most stones and metals are gone. and most forests have become furniture. most boulders are carved into bathrooms. 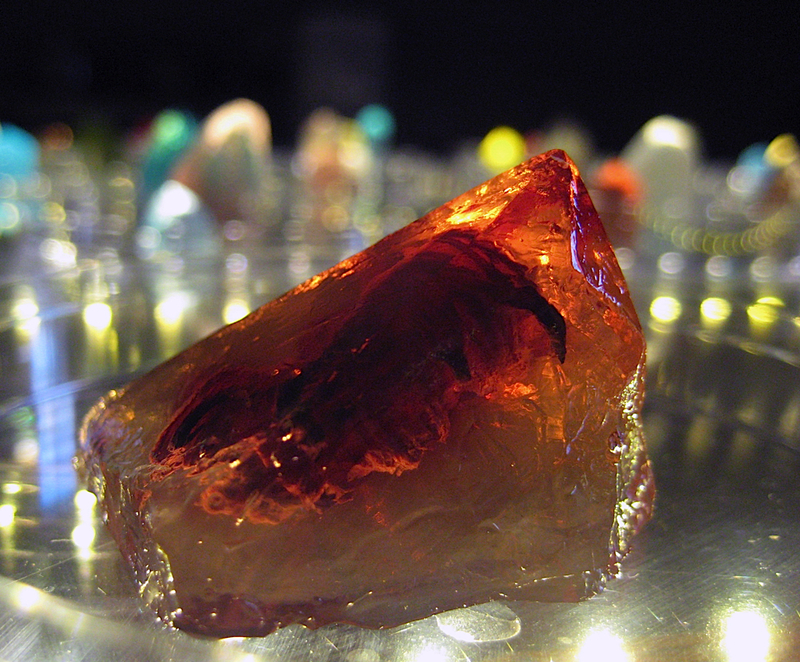 most gems are dancing, adorning human skin. most crystals have become chandeliers. most water is spoiled and most food is spilled. most fields are wasted and most jungles untangled. as an unsolvable mass of matter. making up for a century of abuse, greed and violence. giving man much hope and faith in the future. more respect for the earth and each other. this planet was, and still will be for us humans. to be transformed into dimensional textiles and earthbound colours. giving and taking, and caring for each other.